Hi guys! It’s Monday and the sun is out in Oregon! Seems like the perfect time to show you a little refresh that I’ve been working on to give my house some more fall vibes. First of all, does anyone else decorate for the Holidays? 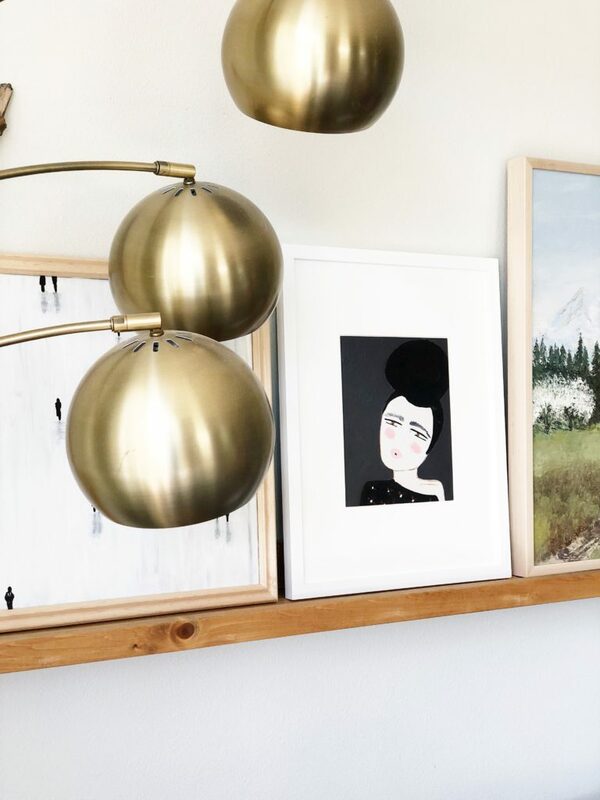 I’ve been hearing a lot of buzz about decorating in a more subtle way (i.e. introducing rich colors with pillows and layering up cozy throws for added texture) rather than flooding your house with pumpkins, ghosts, and goblins. 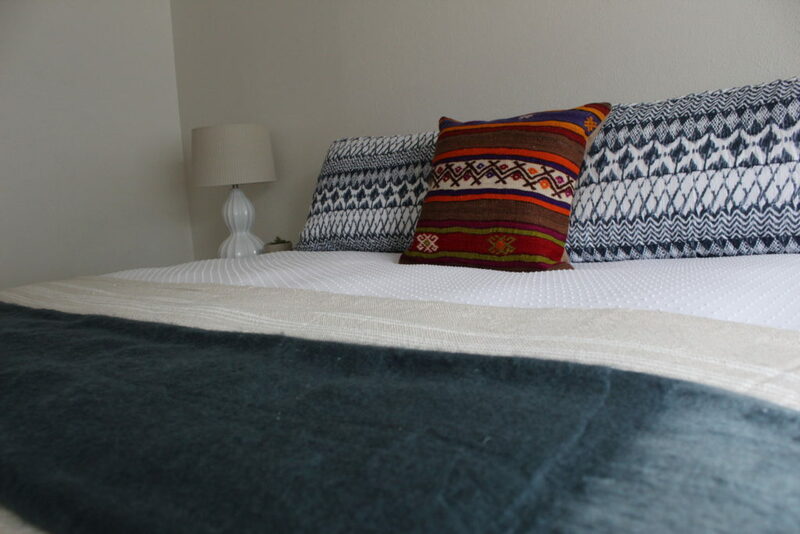 I’m kind of riding the fence on this because I love a good excuse to add a pillow or a throw, but I also enjoy the occasional corny decoration. All in moderation, right? And why not? Anyways…feast your eyes on my fall entryway! 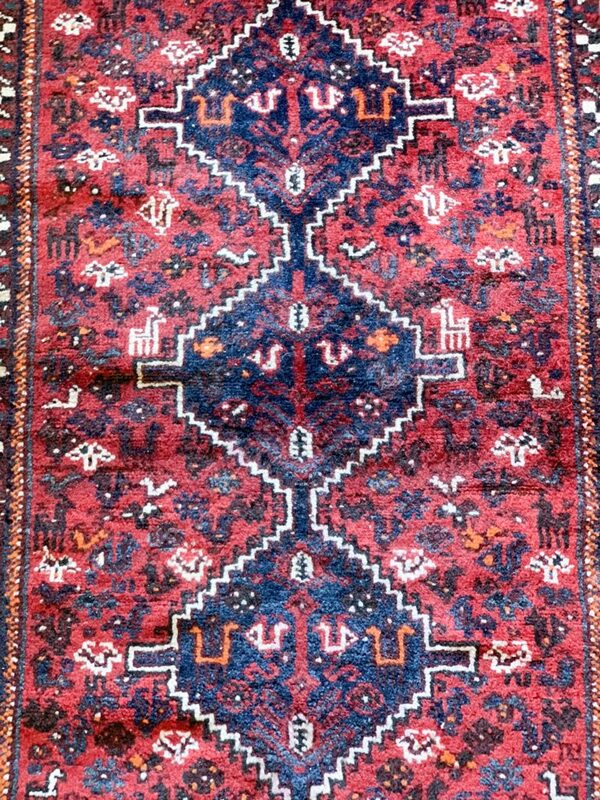 I have been searching and searching for the right vintage rug and I finally found her, ain’t she a beaut? 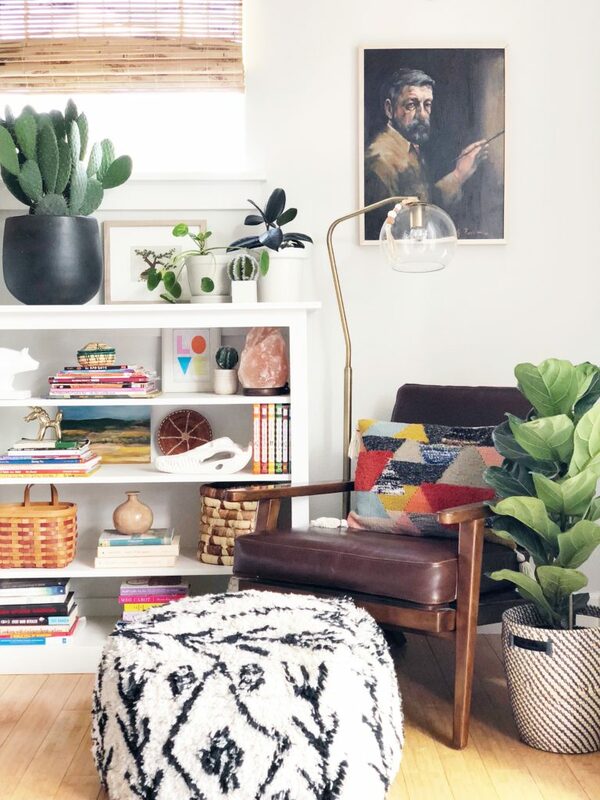 I was sold on a vintage rug for this space as its a high traffic zone and vintage rugs are made to LAST. I have purchased many a rug from big box stores and always found myself replacing them once a year (or even a couple times a year). WHAAAAAA? 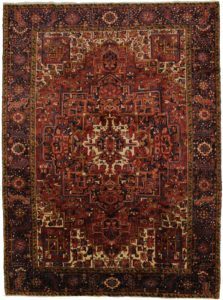 Eventually, I began to realize that with all the money I was spending on disposable rugs, I could buy a better quality rug and clean them myself or take them to have them cleaned when needed. 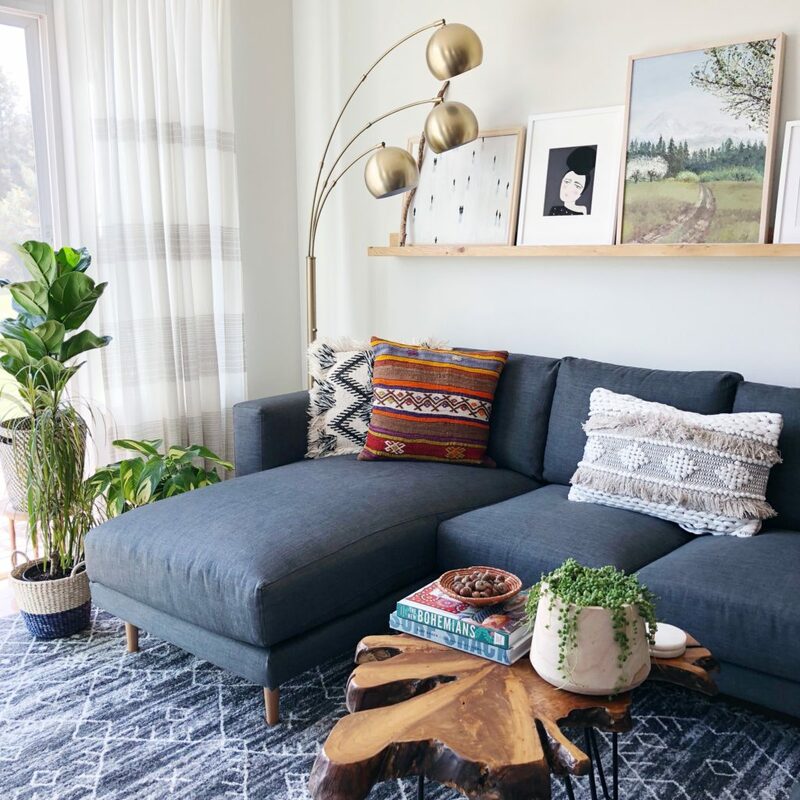 With all this being said, I am not opposed to buying a rug from a big box store, but I really appreciate a rug that’s made with materials that are meant to last, year after year. 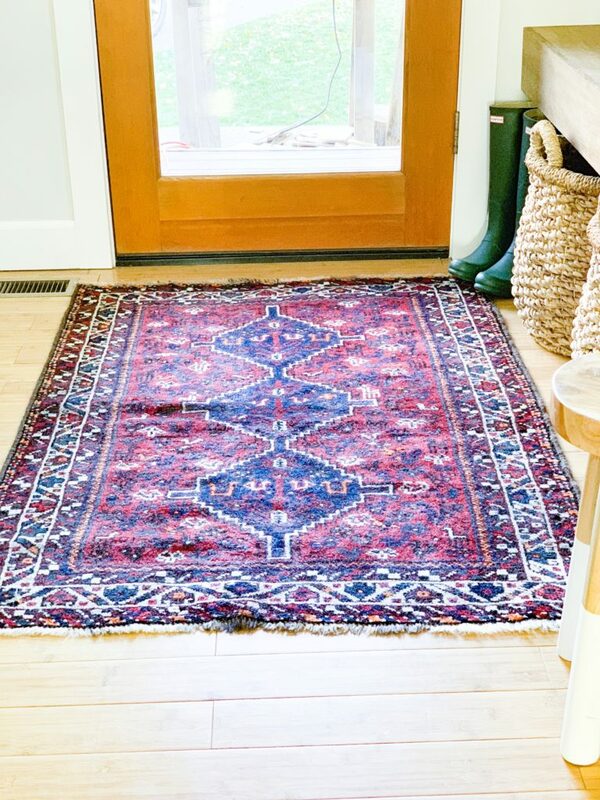 For my entryway, I was lucky enough to work with Magic Rugs and am so excited to share this source with all of you because if you are like me, and cannot resist the charms of a vintage rug, I gotcha covered. 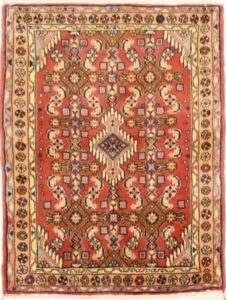 Magic Rugs has over four thousand rugs in stock and you can call them any time with questions that they will be happy to answer for you. And….wanna know the best part? Their prices are actually affordable! So let’s go shopping! I thought I would share a few of my favorites that I found on their site. 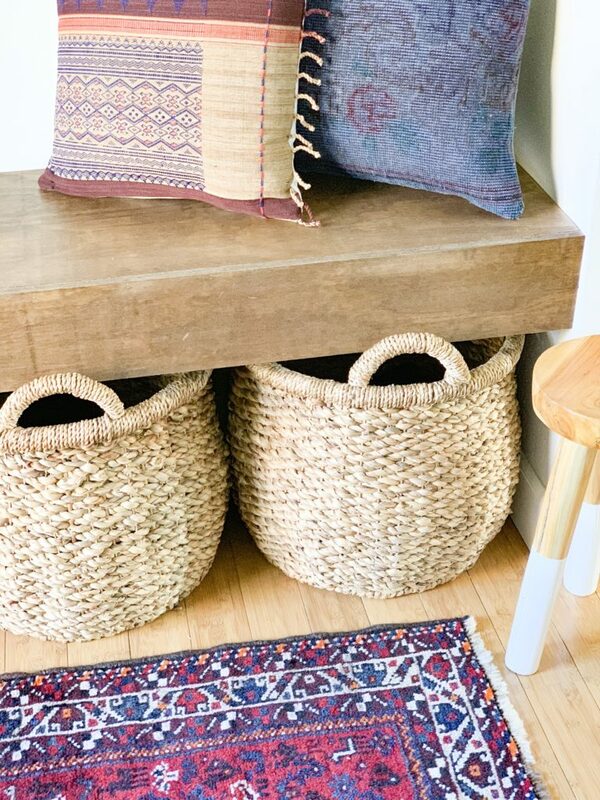 The first and second rugs would be perfect in a kitchen or a bathroom (adds tons of patina and warmth to a room full of hard surfaces) and I like the third one for a living/family room type situation…maybe layered on top of a jute rug if you’re feeling fancy. Ps. 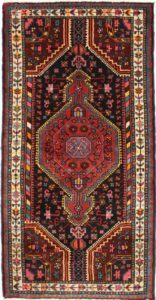 If you like any of these rugs, just click the images for links to see each rug in closer detail. 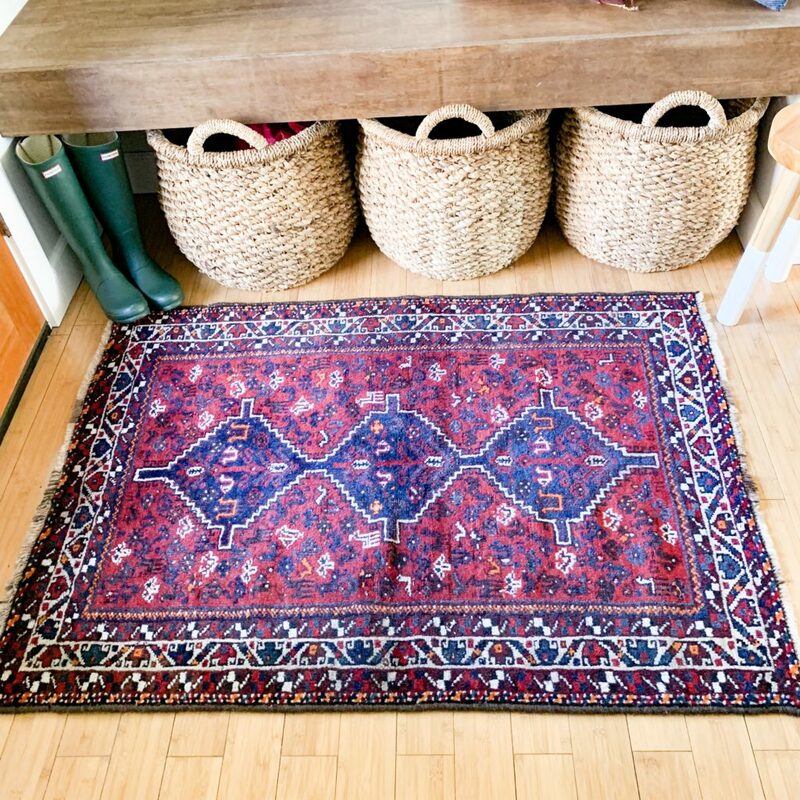 The rug that I chose for my entryway is so beautiful and I am SO happy with the quality. 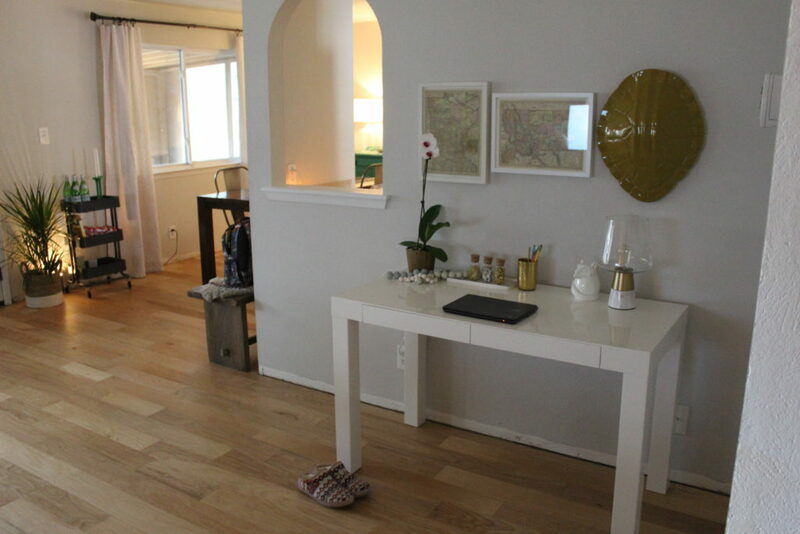 It is soft underfoot and fits my entryway like a glove. It was exactly as pictured on their website which I think is really important. There’s nothing worse than ordering something online, only to be disappointed that the pictures didn’t accurately represent what you thought you were buying. amiright? The colors are perfect for my house with deep reds (I can’t seem to stop using reds lately. Who am I??? ), blues, and pops of orange. I’m in love! 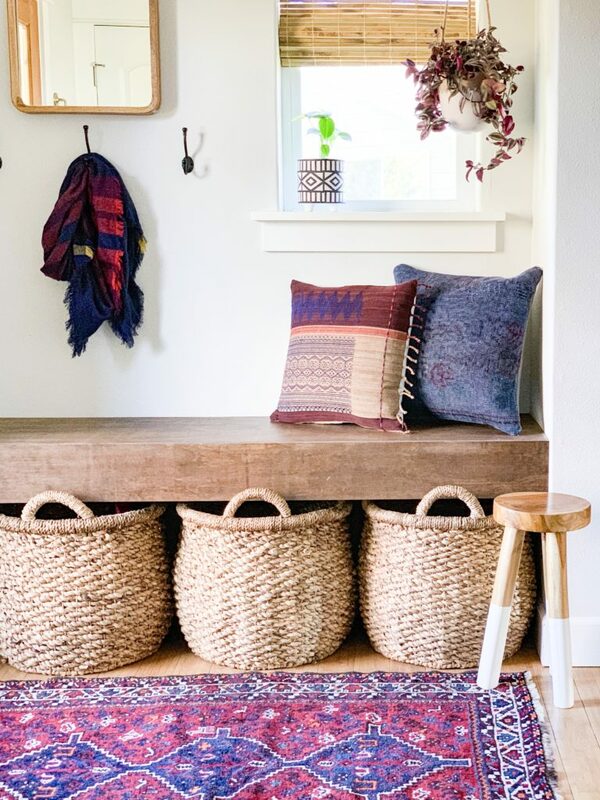 I think it really makes a big impact to my entryway while adding lots of texture. And I am getting all the cozy vibes now! So there you have it! 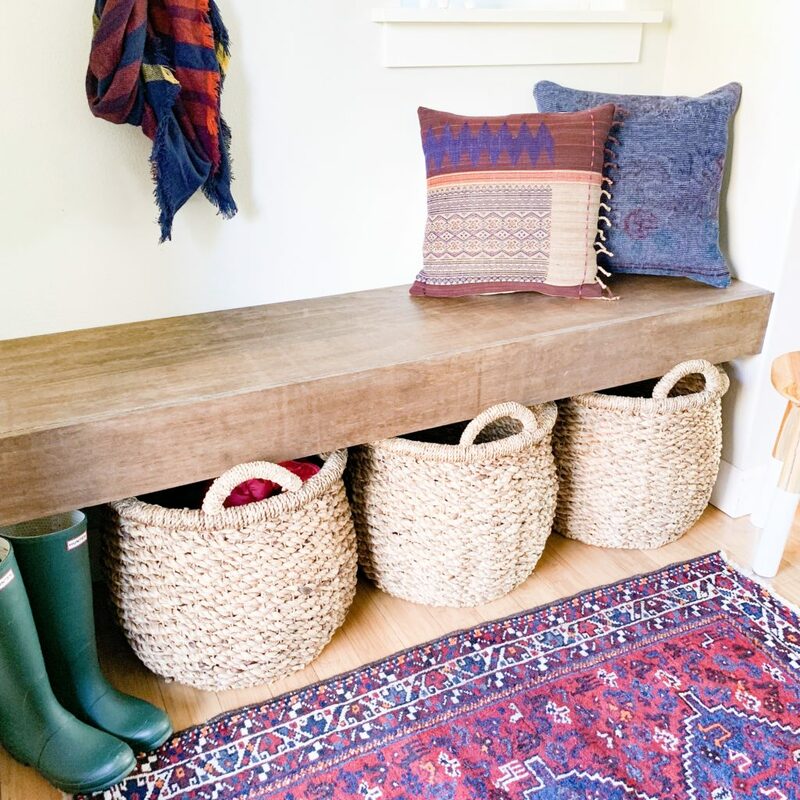 My entryway is looking all Fall-y and cozy with its beautiful new rug! We are busy planning Halloween costumes over here and as of right now, I have a zombie, a vampire, and a bumblebee! Hope you all have a wonderful week! 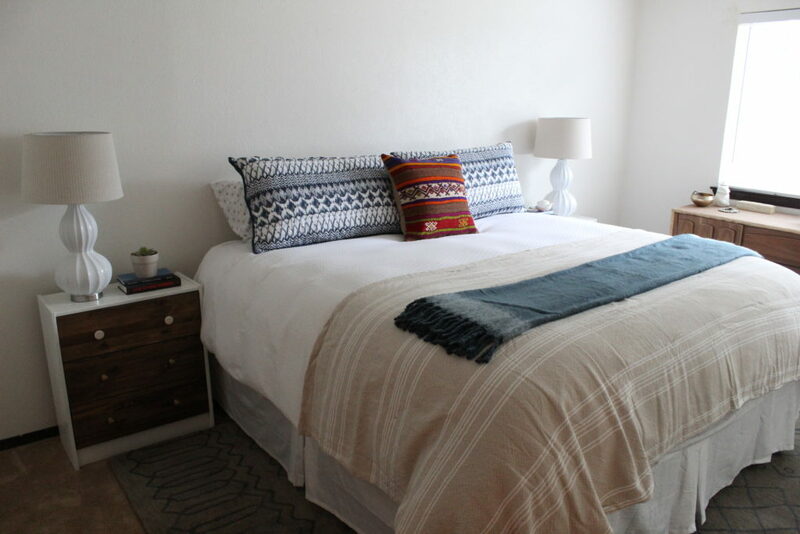 Oh and I’ll be back on Wednesday with my One Room Challenge update for week three…gulp. Happy New Year friends! It feels so good to be back to normal, well, a new kind of normal for our family of five. Our Christmas break was packed. The baby and I flew to Oregon to be with my sister as she had her baby girl in the middle of the biggest snow storm I have ever seen. She is happy and healthy and I am so grateful that I was able to be there for the special occasion. Nate and the kids drove up to join all the fun when they finished up school for the holiday. Our time in Oregon was spent with all the family we could cram into my sisters’ house and the cousins played in the snow, went ice skating, and ran around like hooligans. This was our best Christmas yet! Even though my break was full of sleepless nights with the new baby, I feel energized and eager to begin this new year. We have so many projects planned in the next few months, it’s very exciting. Our house has a long ways to go but at the same time, it feels like we have turned a corner and our little place is taking shape! Let’s do this 2017! Thanks for hanging in there as I reflect for a second. My time off wasn’t just a swirling blur of bottles and diapers. We still managed to get a few things accomplished. First, Nate and I decided that some new appliances for the kitchen would be the perfect Christmas gift to one another. Aren’t we exciting? Some people go on vacation, we buy dishwashers. 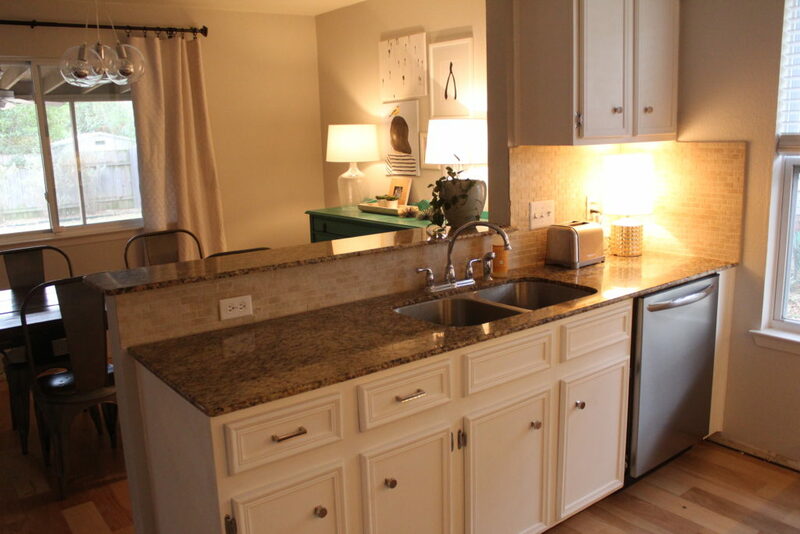 Although it isn’t a DIY project, it does really improve the overall feel of the kitchen. 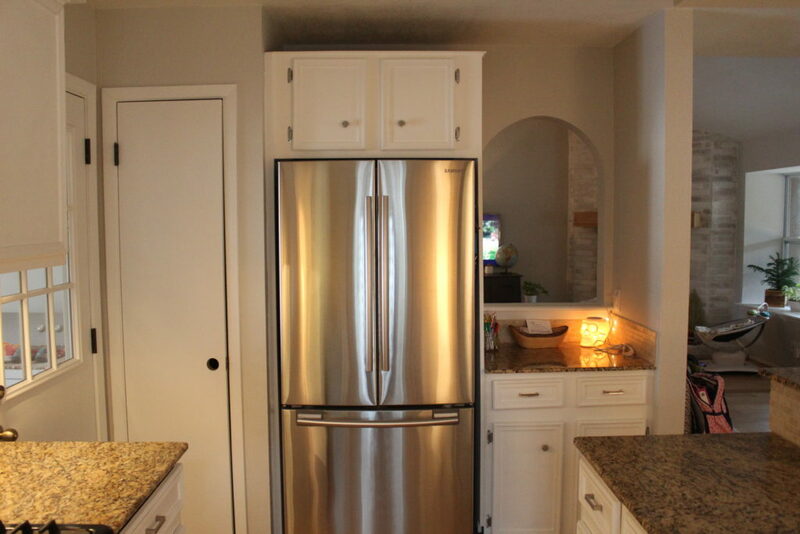 Is it weird that I want to pet the new refrigerator? 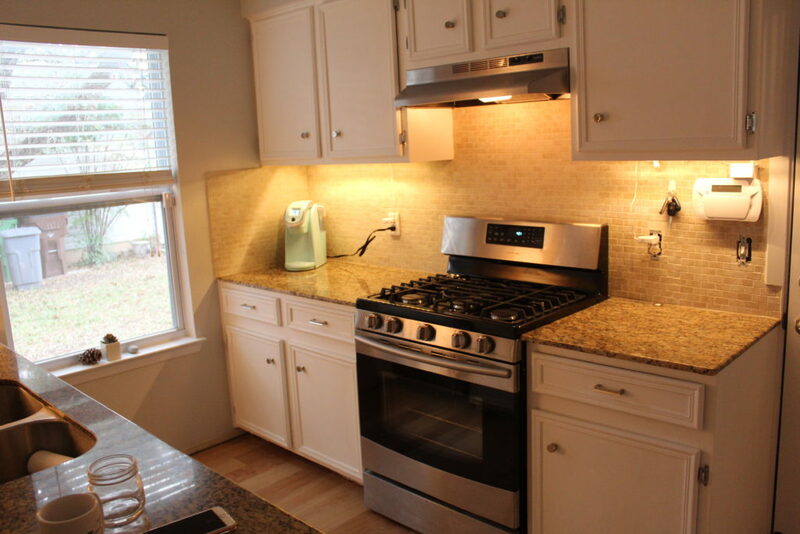 A few months ago, we bought a new range and hood and planned on replacing the refrigerator and dishwasher just as soon as we saved enough for them. Well, that time is here and I couldn’t be happier about it. Appliance shopping is my idea of a good time. So. Much. Pretty. Any big purchases we make, especially when it involves electronics/appliances, Nate does the research and I narrow down the options based on appearance or other practical aspects that I experience with every day use. The other little project is a shared office of sorts or workspace for Nate and me. Nate often finds himself doing some work from home and it isn’t unusual to find him answering emails or checking his calendar from our home computer. He usually just does this from our dining room table but with our kids spending close to an hour every night doing homework at the same table (that’s a whole different issue…don’t get me started), it made more sense to make a designated space that he could work from, separate from the kids. 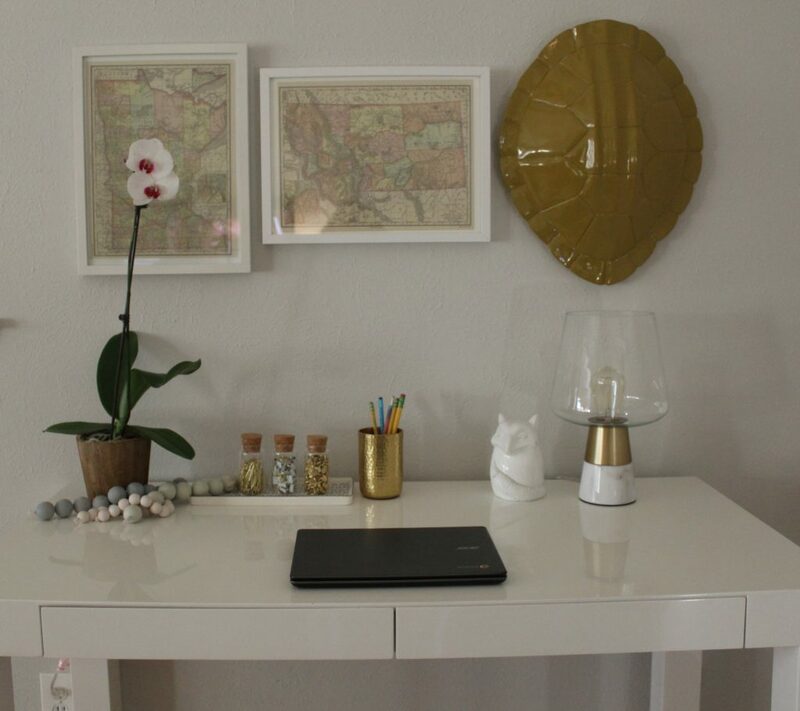 I also have enjoyed having this space for photo editing, blogging and emailing. It’s a win, win, win. There is an awkward corner behind our sectional in the living room that I have been scratching my head over since we moved in. Previously, I just shoved a shelf in the corner and I was using it to corral random decor that I didn’t know what to do with. 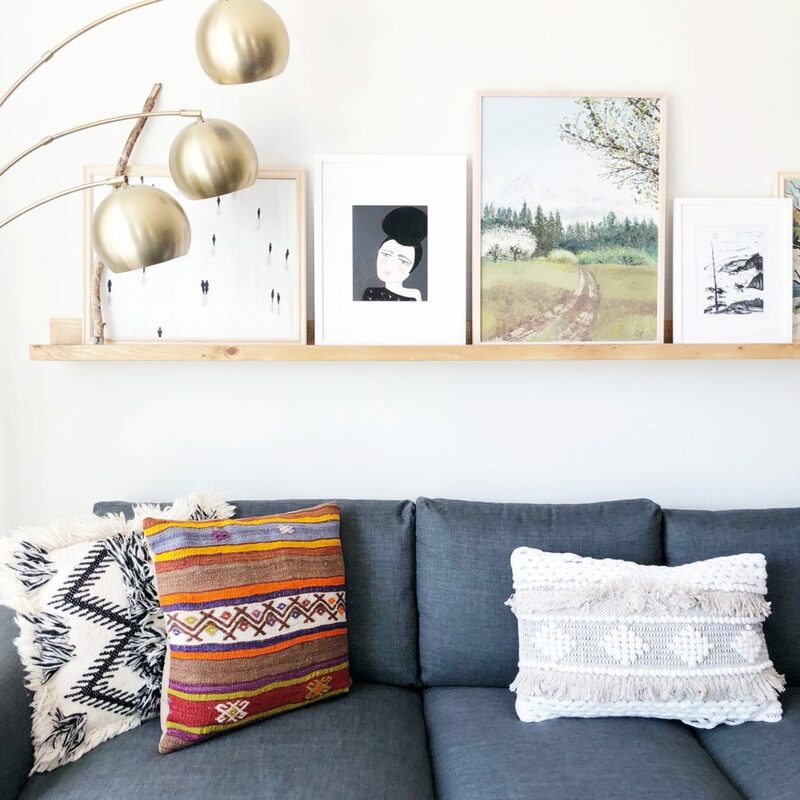 That solution quickly began to feel like a waste of space and with three kids and only 1,648 square feet of living space, why would I waste a single inch of it? 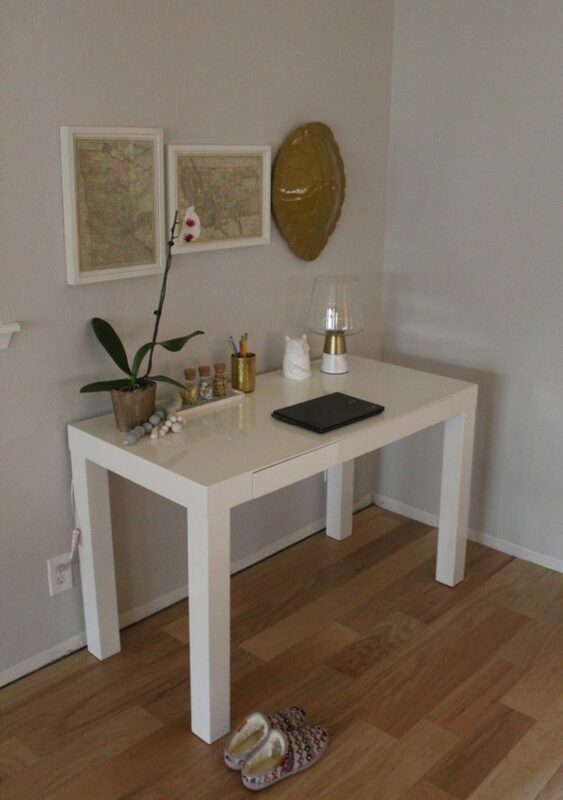 Enter workspace idea! I spotted this chair at World Market and was thinking that it might be perfect. I love the rich color of the wood and the upholstered seat is super fun. 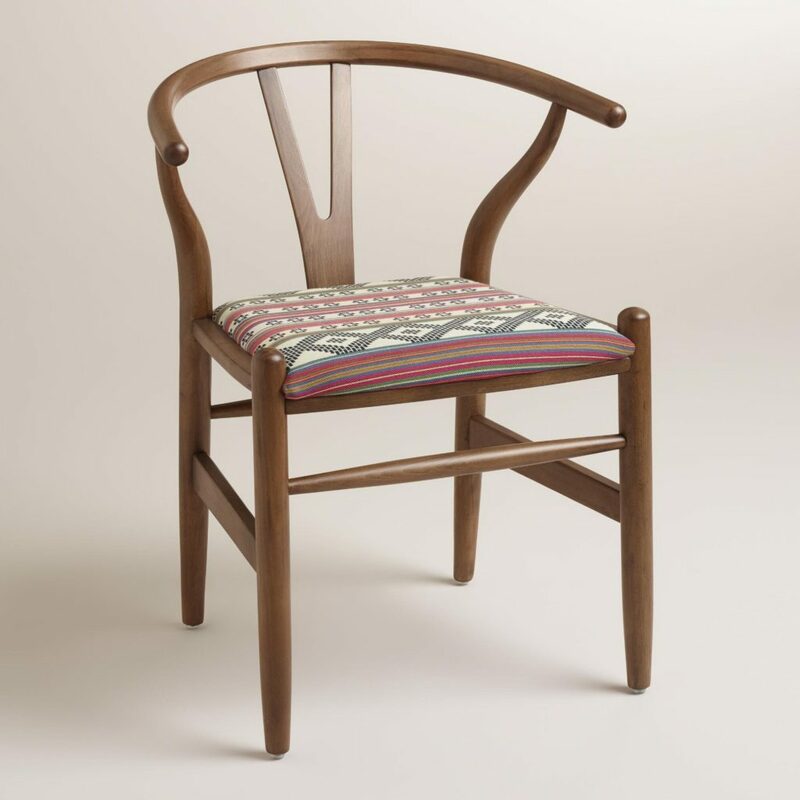 Since the desk has such modern lines, a wood chair might be a good way to bring in some warmth and texture. 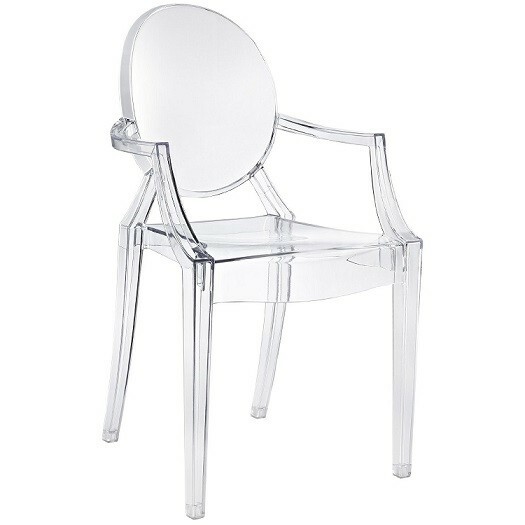 I love these acrylic chairs. I have seen them a million times and they seem to work in just about any kind of design situation. That’s super appealing to me as I could just move it somewhere else if I got sick of it or didn’t like it for an office chair. Hmmmm….oh the choices. So those are just a few of the things we have been up to around this house. Like I said, I feel so good to be getting back in the swing of things around here. Oh, and we have some exciting progress to share that’s been happening in the bathrooms. If you’ve been following along you may remember our bathrooms were in serious need of attention. You might have blocked those pictures from your memory though and I wouldn’t blame you for that. P.s. Be sure to check my house tour page because I FINALLY updated it! So, I know that I said that I would be back to update the progress on the ceiling texturing. 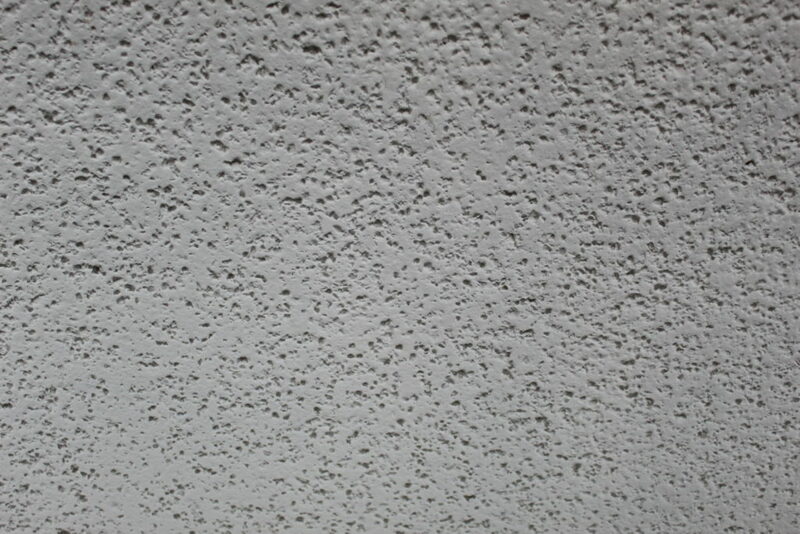 And nothing…well, the only excuse I can come up is that texturing your ceilings is hard. Hard and time consuming. The good news is, we are done. At this point, I only have a few rooms painted because after the super hard part is done and you have brand new texture, the last step is painting them. That’s your reward for your hard work. You’re welcome. Right after we moved in, I started scraping the popcorn that covered every inch of our ceilings, even the ceilings in the closets. Oh, I was so enthusiastic about starting this project. I told Nate we could get this done over the course of a couple weekends. Now that we are nearing the actual end of the project with only painting left to do, I underestimated by about a month. Ha! Oops. Here is what we started with. We did a lot of research about which new texture to go with and after asking our realtor what she sees in most houses in our area, we decided we would go with the knock down method. It’s pretty simple but after you spray on the texture with a hopper, you basically take a flat edge and knock down the peaks that leaves you with a smooth surface with little (and some not so little) islands, as we started calling them. After scraping the whole house, patching with joint compound, sanding, patching a second time, sanding a second time, spraying on the new texture with a hopper, and knocking the texture down, this is what we are left with. Once it is painted, it basically looks the same, but has a more finished or polished look. For all of that work and for such a long process, I wish it was more exciting than that. But, it is making a big difference in the house and I swear everything feels brighter and less dark. 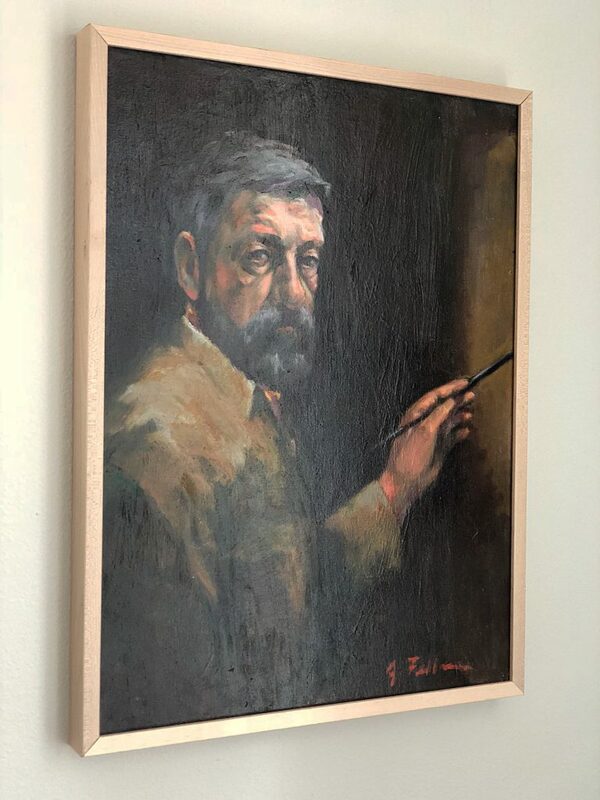 I think it will be one of those things that will make a overall big difference once we start updating some of the cosmetics in the house, like wood flooring, painting our trim white, and painting the walls. Popcorn ceilings are no joke people. There have been lots of other smaller updates going on around here too. Since the ceilings are wrapping up, I have the luxury of focusing on some prettier things. Like lighting! 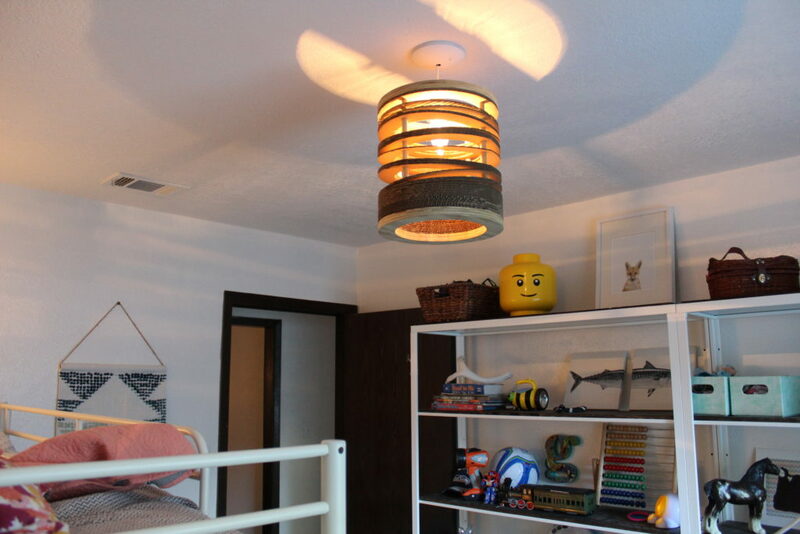 Nate hung the fixture in the kids’ room yesterday and it looks so good. 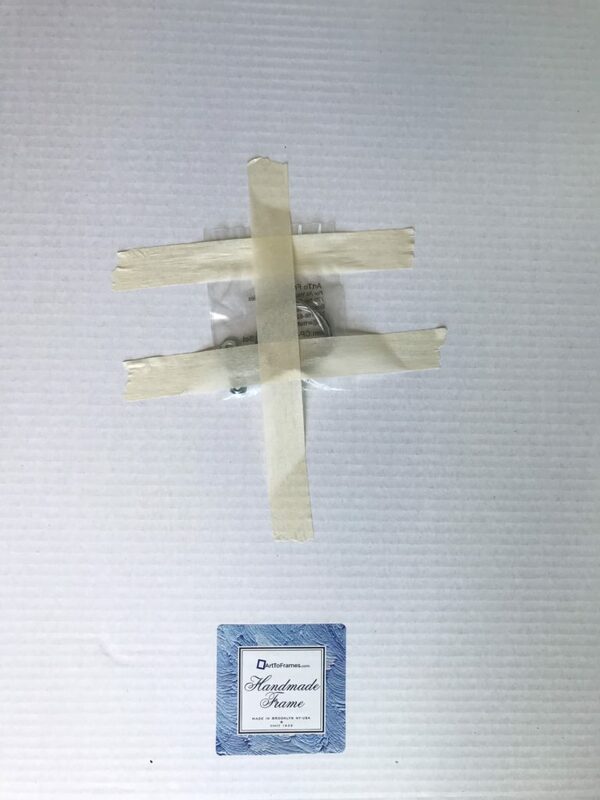 For the last month, there has been a vacant hole in the ceiling with wires hanging out so this is a big improvement. I scored this guy at Anthropologie a few years ago when I was wandering through the home section (you mean they actually have clothes???? What?!) 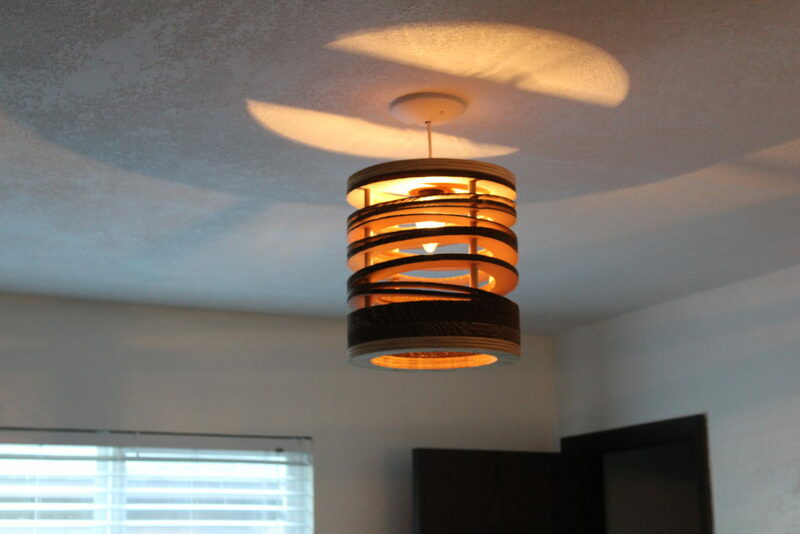 and noticed this light fixture that someone had ordered online and returned it to the store so they marked it down like 3000%. It casts a very warm light that feels super cozy and Grey told Nate it was his “party light.” Five year old minds are the best. In other parts of the house I have a little experiment with spray paint happening. You see, the hardware on our doors is just ugly. On a scale of 1 to 10 in ugliness, 1 being beautiful, and 10 being the worst of the worst – ours are a 10. 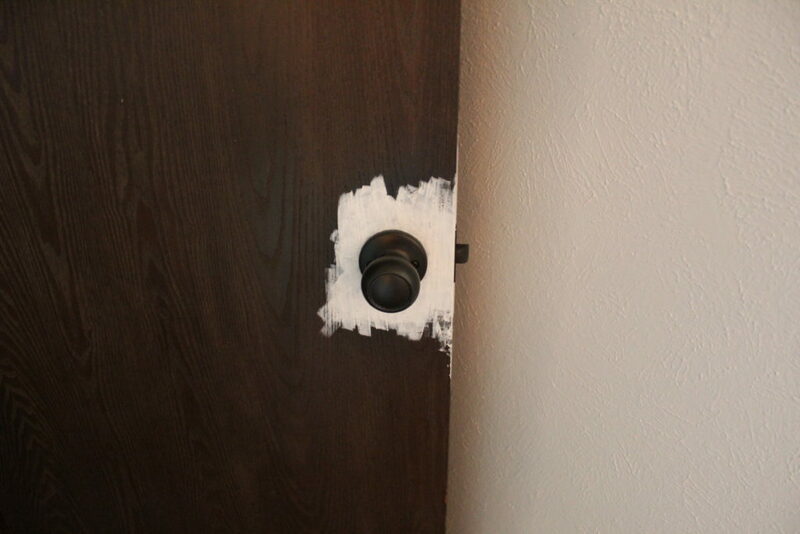 So, since it looks like we will making a little investment in door hardware, (which I have come to learn is NOT cheap) I thought I would try and give it a coat of paint to see if it holds up. If it doesn’t, we haven’t lost anything because we are planning on replacing them anyways. 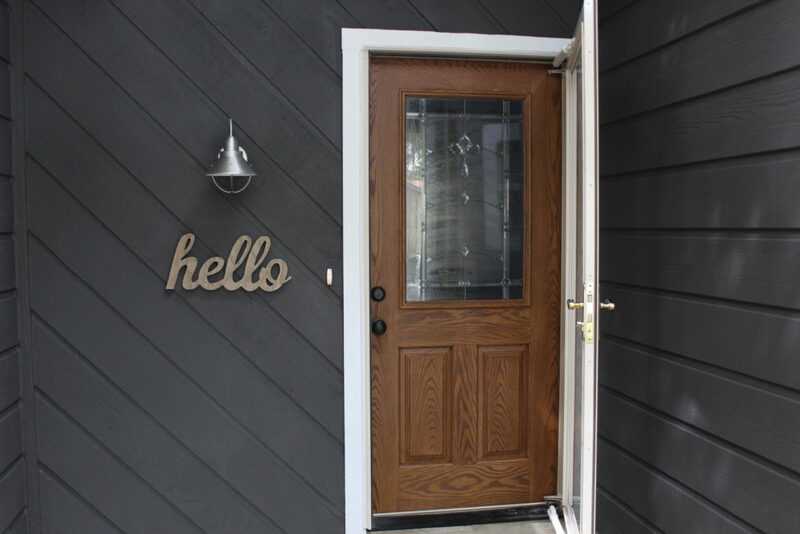 I have seen other bloggers use Oil Rubbed Bronze on door hardware before with a top coat with positive results so I thought I would give this a whirl and see how it goes. This is our hardware before paint and top coat. Geesh. After a couple of coats of paint and top coat, they are looking more like this. I probably should have also mentioned that I started painting all of the doors and trim around the house too. I know, I have a million things going at the same time. F.O.C.U.S. I have been feeling good lately with lots of energy so I am taking advantage of this momentum before baby boy comes in November. Too much to do, too little time. 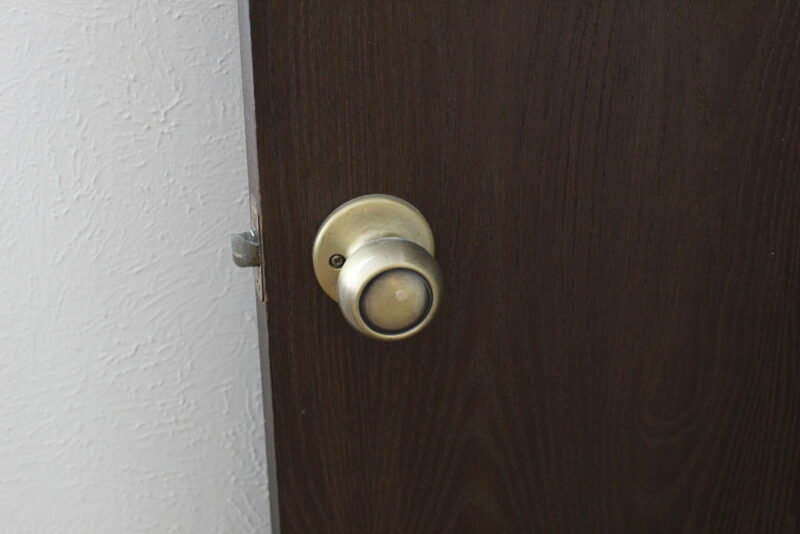 But the doorknobs are looking better, no? I will keep you posted if the paint holds up through every day use. 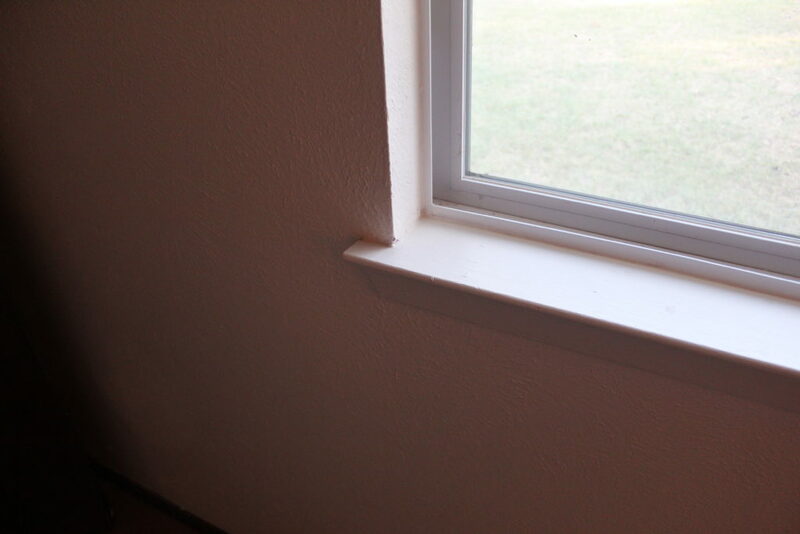 Here are a few more shots of the trim around the house that needs to be painted. I believe they used a very deep chocolate brown and just painted the trim. From far away, it appears to just be a very dark, stained wood. But it is not. It’s shiny too and reminds me of milk chocolate if you melted it on the stove top. Yum. On our trim though, yuck. And once again, white paint for the win. The last update that we made to the house this last week isn’t diy related but I thought I would mention it because Nate is in love and it is a house update. We bought a new range for the kitchen! This was a fun one because it’s functional and looks so pretty. 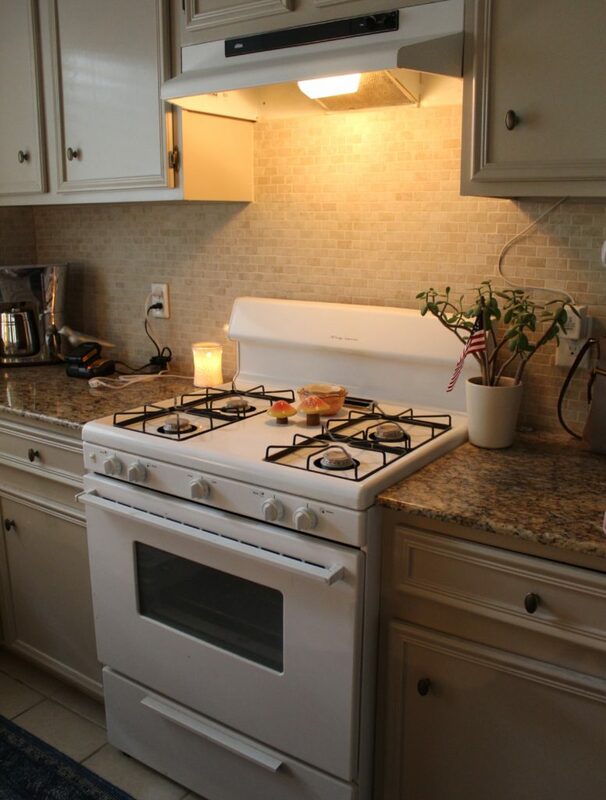 The range that came with the house worked just fine but we are eventually going to upgrade all of the appliances to stainless steel so we thought the range was as good of a place to start as any. We listed it on Craiglist and it sold the next day so we were even able to recoup some of our investment. And here is the new one. So, I think that about wraps up everything going on around our house for the week. Sorry about the brain dump but we’ve been busy. Really busy. Ps. I updated my house tour with some progress pictures so you can see where we started when we moved in and where we are at today. It’s starting to look better…I hope! Happy happy Friday! This week flew by after having Monday off for a holiday. 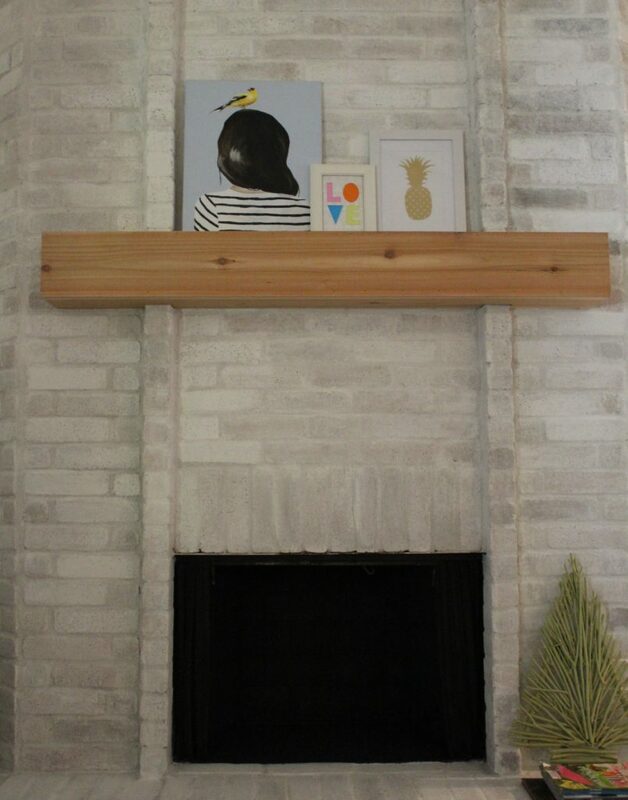 But I wanted to do a quick update on the fireplace since I am loving my new little additions. 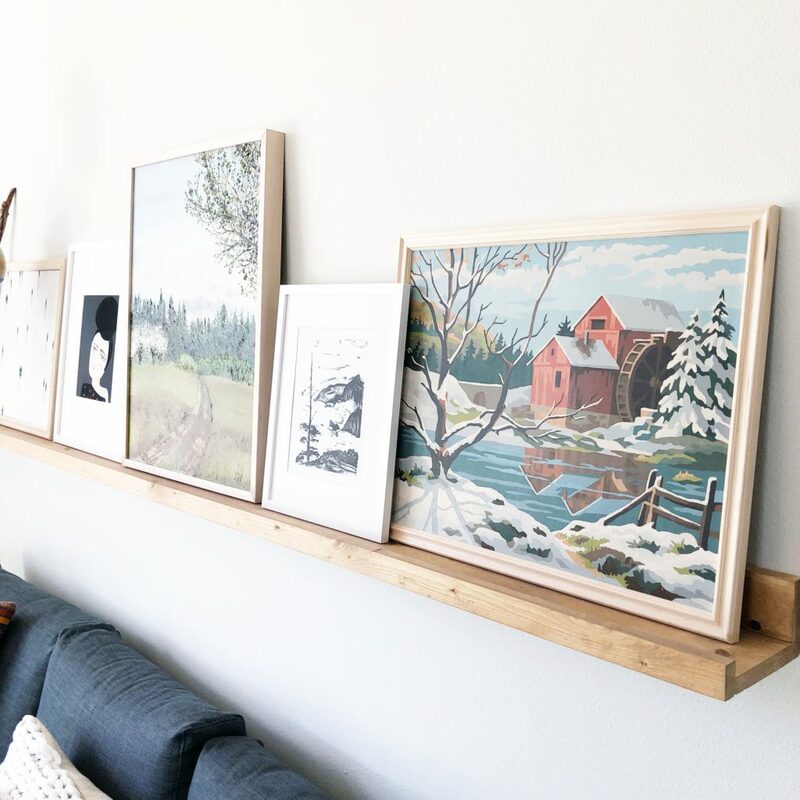 I have been having too much fun trying out new art and decor on the mantel but I also had some birch logs arrive from Wisconsin that I am loving. They are so pretty I just want to pet them. Some people would call this a problem…I don’t. On another (less weird) note, I am hoping that I will have pictures on Monday of our ceilings done! Or at least, a good chunk of them done. We are renting a hopper tomorrow morning and getting this project buttoned up once and for all. Also, we are going to sneak in a trip to the movies to see Finding Dory. Should be a fun weekend. Wish us luck! We are going to need it! Whew! 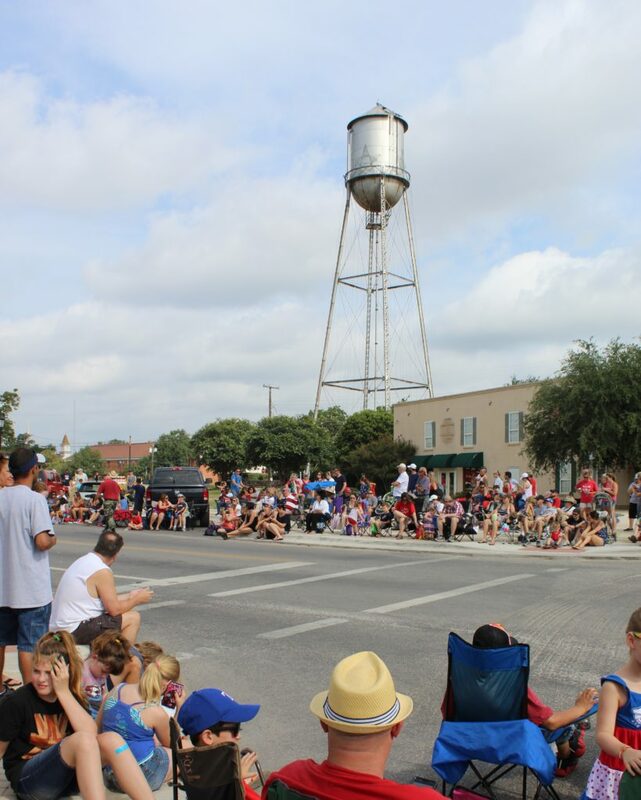 This weekend we celebrated the 4th of July and attended a parade, a fireworks show and two different BBQ’s. It was kind of a whirlwind but we all had fun. 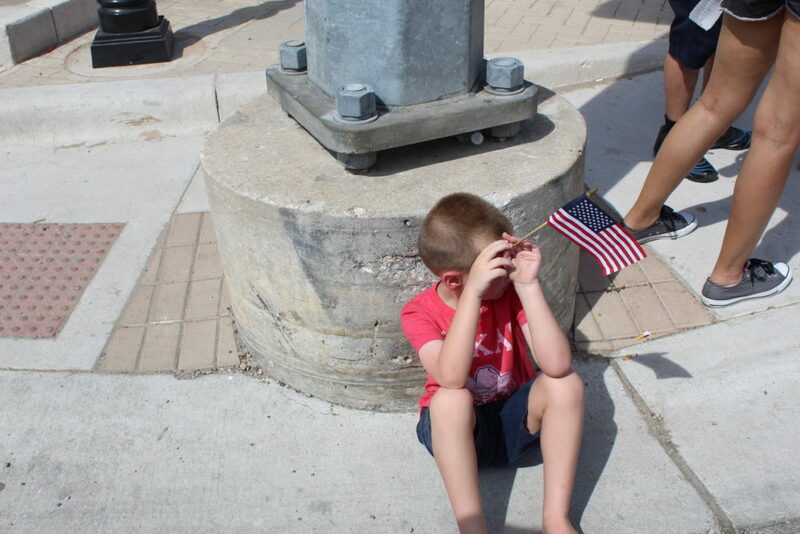 The parade was one of the best I have seen and shouldn’t have been surprised that Texans know how to do a parade right. The kiddos scored major in the candy department and we all nearly died in the almost 100 degree heat. In between all of the festivities over the weekend, we were able to get a project done at home. Yes! 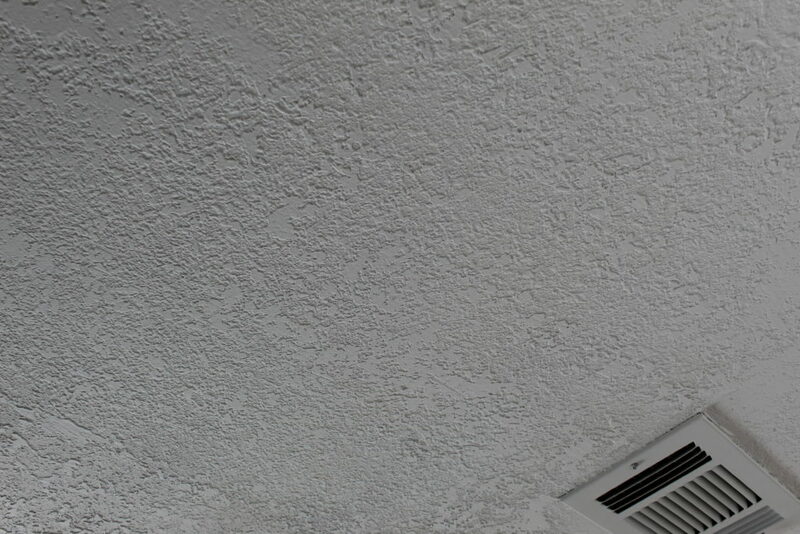 Am I talking about our ceilings that still need texture and paint? No! I swear though, it is happening this weekend. Seriously. 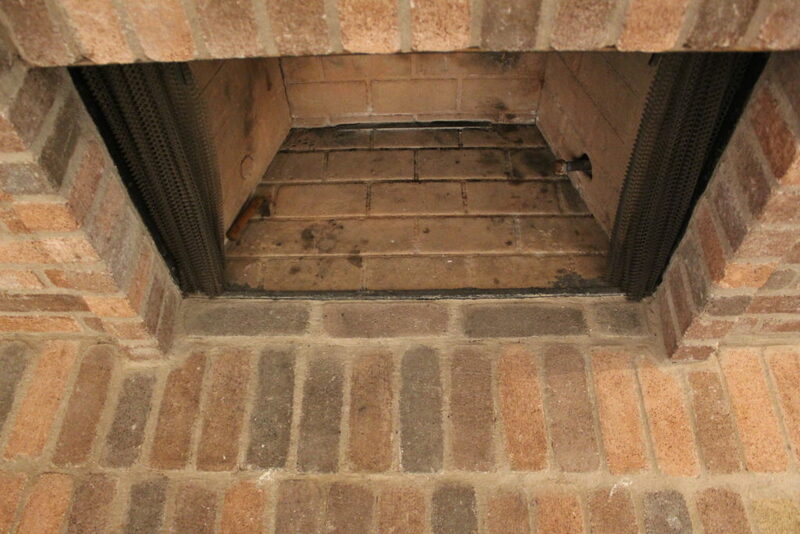 I think I mentioned previously that I was going to try my hand at white washing the brick fireplace. I have been looking at tons of inspo pics of white washed brick and I love the way it looks. My favorite thing about white washing is how it leaves the differences in the individual bricks behind and doesn’t completely cover them in an opaque finish the way a latex paint would. So the overall impression is a much less polished look which I think is appropriate for brick because it’s not meant to be perfect. 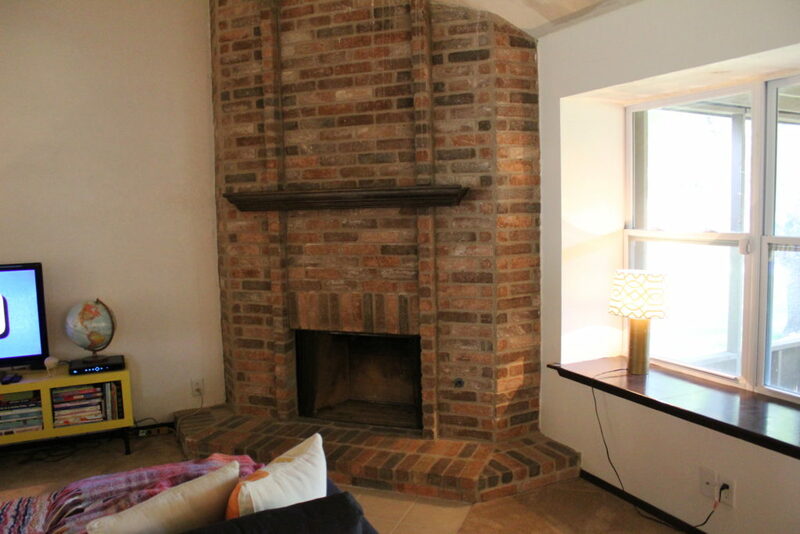 Here is our fireplace. 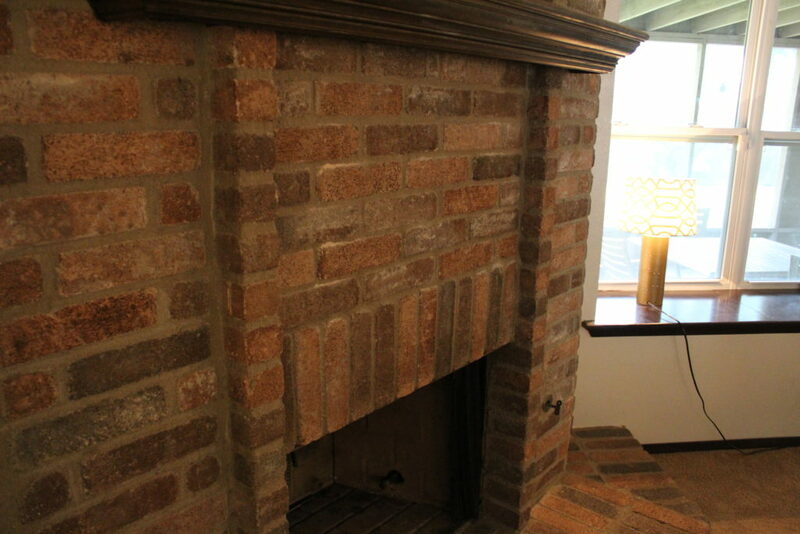 Usually, I love unpainted brick because I am always partial to rustic finishes, but this particular brick was related to the brick that was used on the outside of the house and most definitely had some pink undertones. Pink brick = not a good look. So, let the white washing begin already! 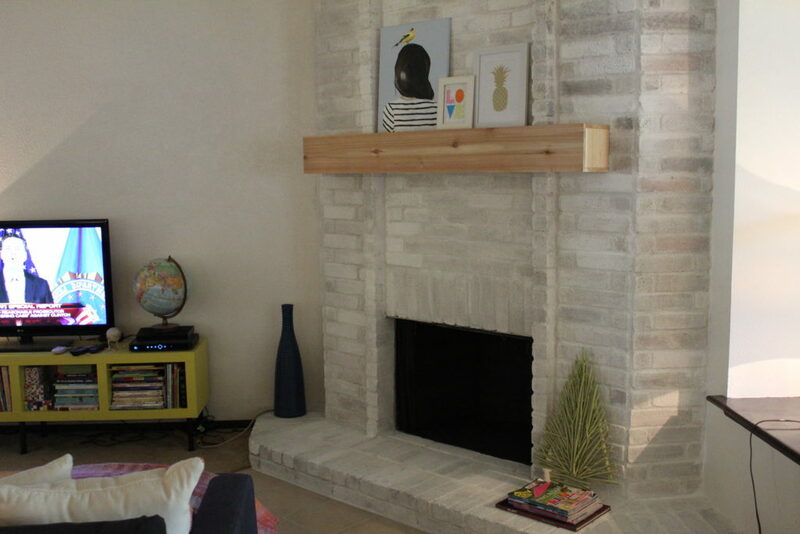 In addition to white washing the brick, I knew the existing mantel needed to be altered. Some ideas included starting a fire in our fireplace, ripping it off with sledge hammers and throwing the mantel in the fire. 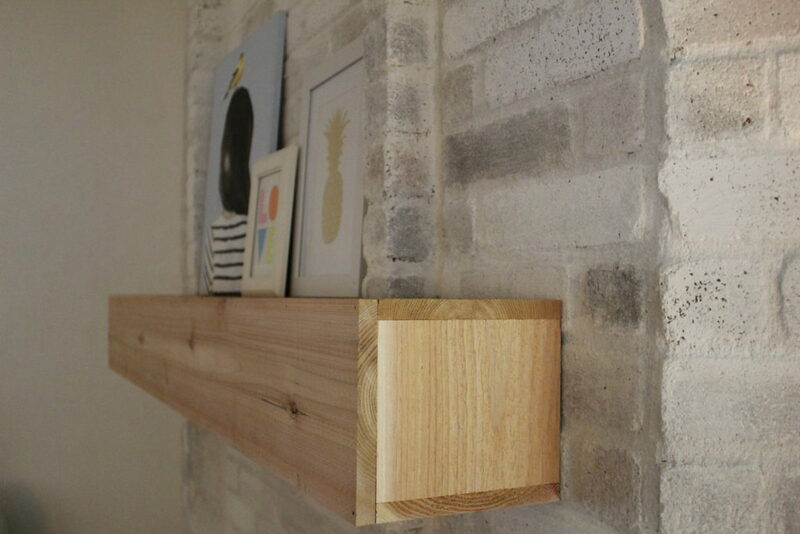 But, instead of going down this road, I found some pictures online of some simple chunky mantels that people built themselves. I showed these pictures to Nate and asked him if he thought he could do the same. After quite the pep talk, he reluctantly agreed and was nice enough to give it a try to see what he could come up with. The white washing part of the project was FUN! I already had some white, flat paint and just mixed equal parts water and paint and painted it on with a brush. 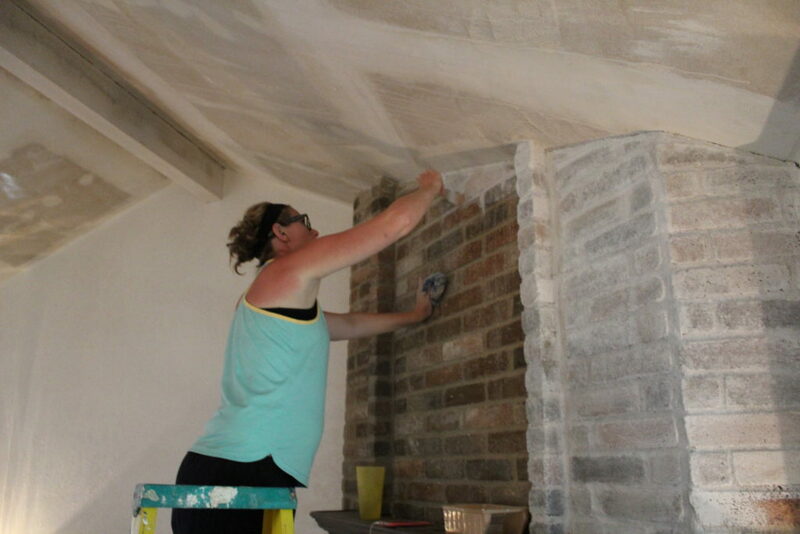 It went much faster than traditional painting and the bricks do all the work for you. 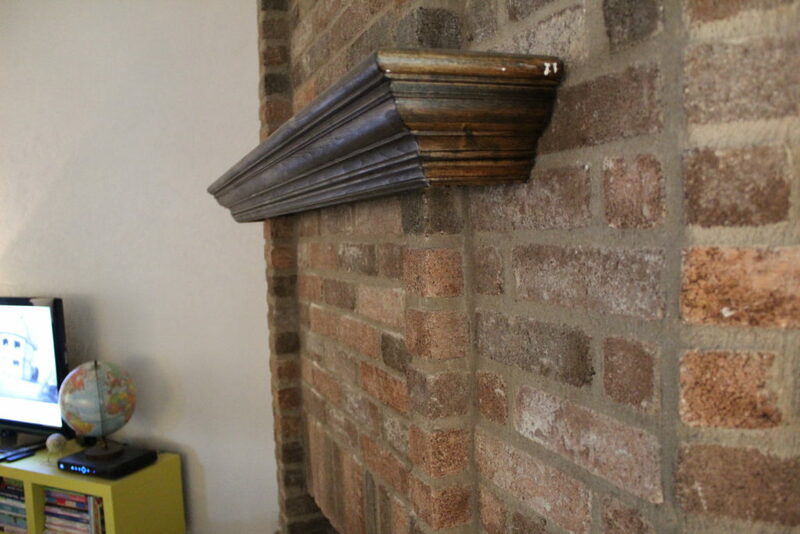 After you apply the wash, the bricks soak up the water and paint that leaves the uneven, white washed effect. Please ignore my sun burnt arms, I went outside for three minutes and only used a sun block with spf 1000. Also, please ignore our ceilings. Seriously, we are going to get them done this weekend. After Nate had taken down the old mantel, only the supports were left. Nolan and I decided that it would be fun to write a message in a bottle and hide in the frame before Nate attached the new mantel. 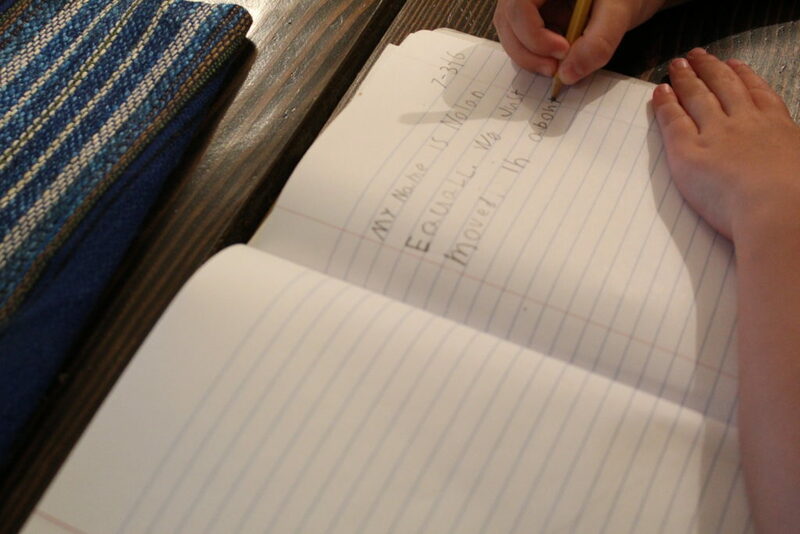 We had so much fun dreaming up scenarios where/when someone would find our letter. Her ideas were too cute. After our letter was hidden away, there were a few, last minute jobs that needed to be done in order to check this project off our list. There were some very visible cracks that became even more visible once the bricks were white washed. 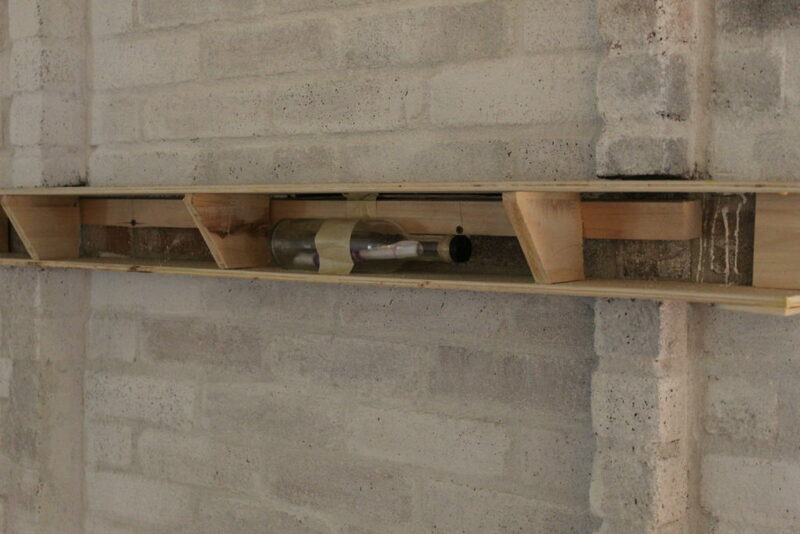 It was a pretty simple task but I had to mix some mortar cement and patch all the gaps and cracks. 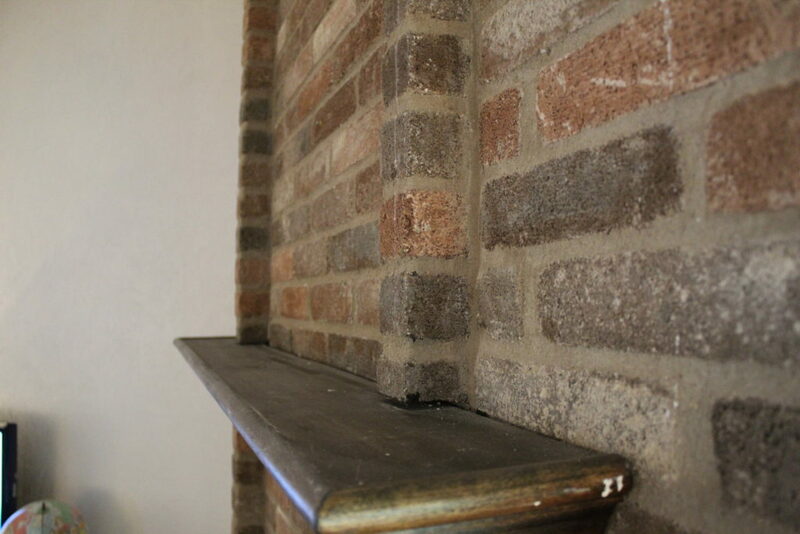 We also used some black, high-heat spray paint and sprayed the inside of the fireplace so the brick inside looked new again with a fresh coat of black paint. 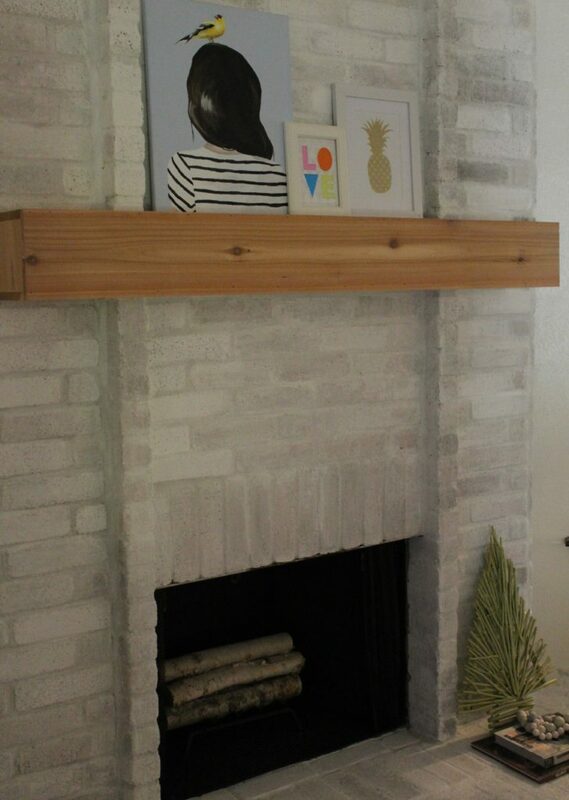 And, finally, Nate finished the mantel and attached it to the existing frame. I am so proud of him. Not too shabby for his first try at building something, right? 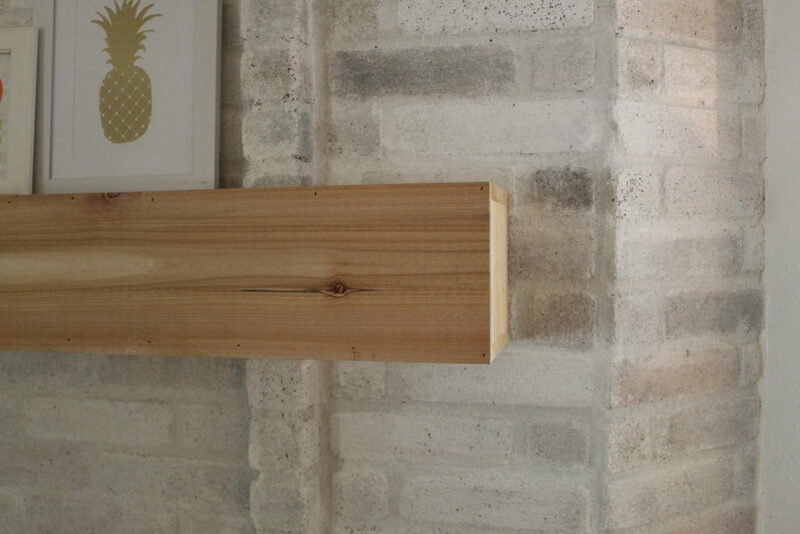 He made the mantel out of cedar planks and I haven’t decided if I should seal and/or stain it. This was a really fun project and being able to include Nate and Nolan made it even more fun. And because I already had the paint for the white washing, the grand total for lumber, mortar mix and a can of spray paint only made a $32 dent in our pockets. Big impact for a small amount of cash! Everybody wins. 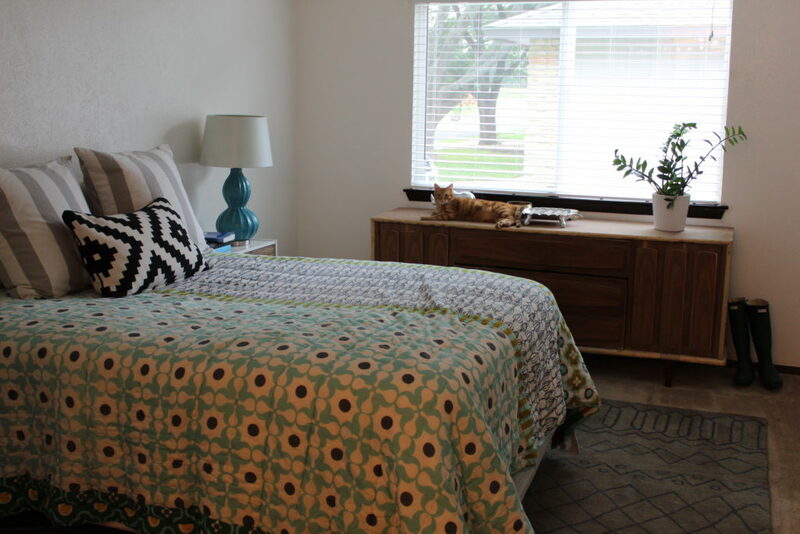 I’m embarrassed to say that this is that SAME bed while we were moving into our current house last month. The mattress had begun to sag and every night I would spend a good amount of time trying to climb out of the hole that was the middle of the bed. As this baby gets bigger and so do I, I finally convinced Nate to consider a new mattress. After some shopping, we found a super good deal on a king size set at Costco. Done and Done! It’s so nice sleeping on a king size bed. I think the few times I slept on a king was when we stayed at hotels on vacation. 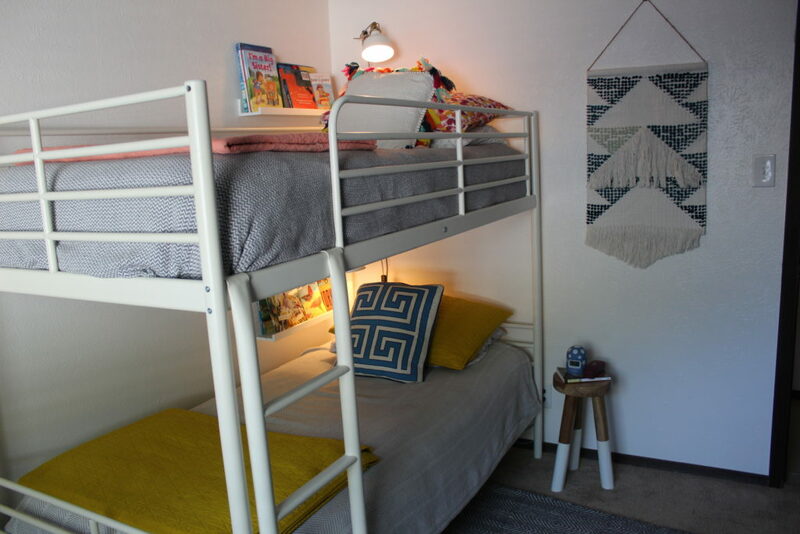 Nate is 6’3″ and I am 5’10” so this extra space is so much sweeter for two tall people and the occasional cute five year old boy who sneaks in for snuggles with us at 3am. Finding pretty bedding for a king bed at a good price though, proved challenging. 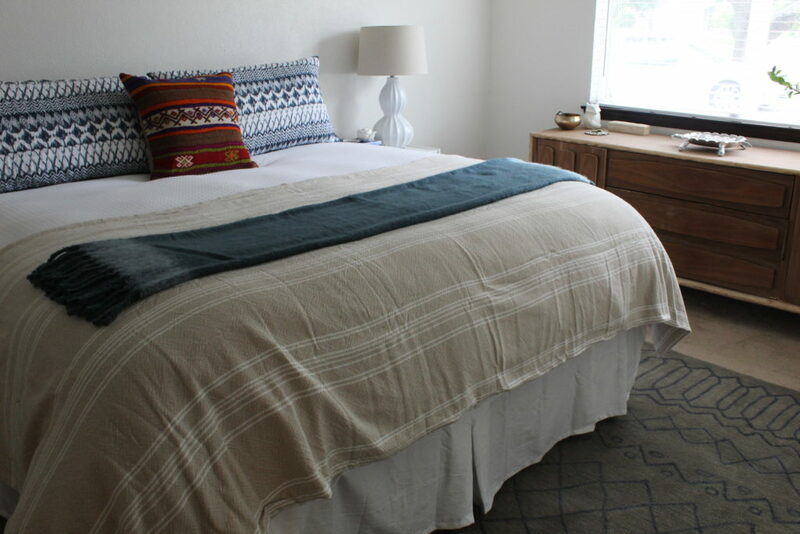 I have been so inspired by the African mud cloth throw blankets and I wanted to score one for the new bed. But, all the ones that I loved were in the $120 range. I could already hear Nate asking me why I spent $120 on a blanket for the end of the bed. So, I passed and decided I would come up with a different look. 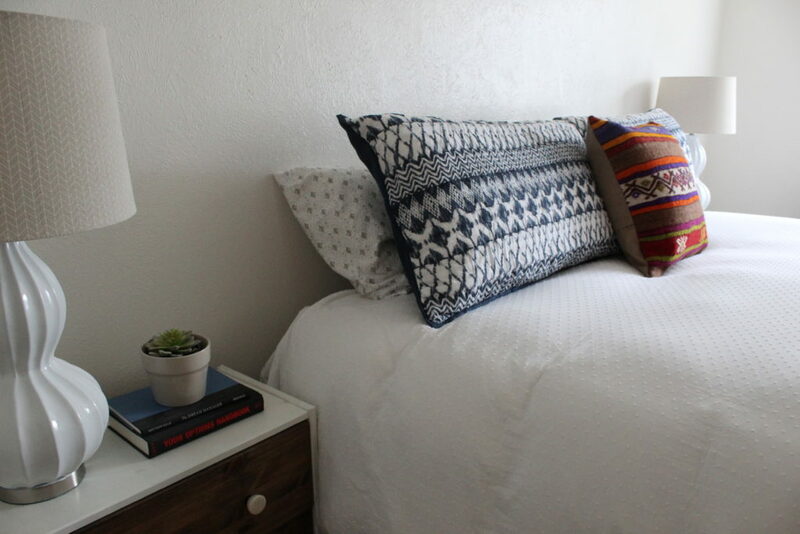 Okay, I guess I could spend some more time hunting for beautiful bedding online…sigh. Beautiful, no? 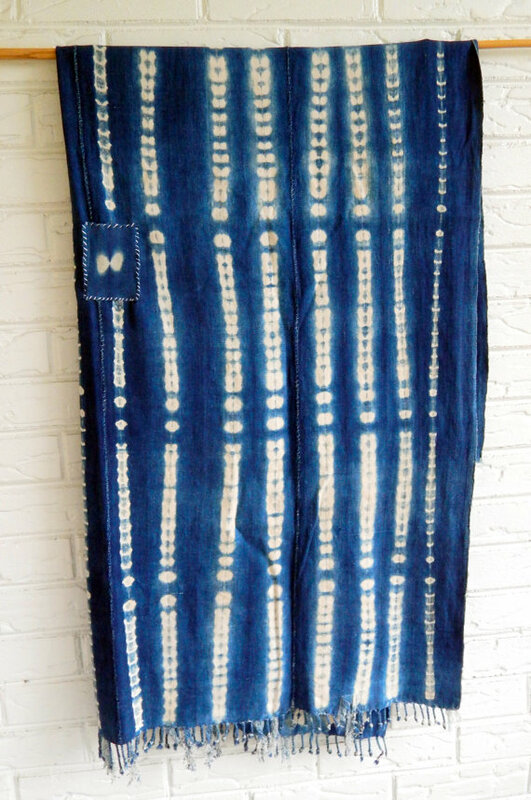 The good news is, I ended up finding some shams at Target for $15 a piece that almost mimicked the over-dyed blue look of the mud cloth. 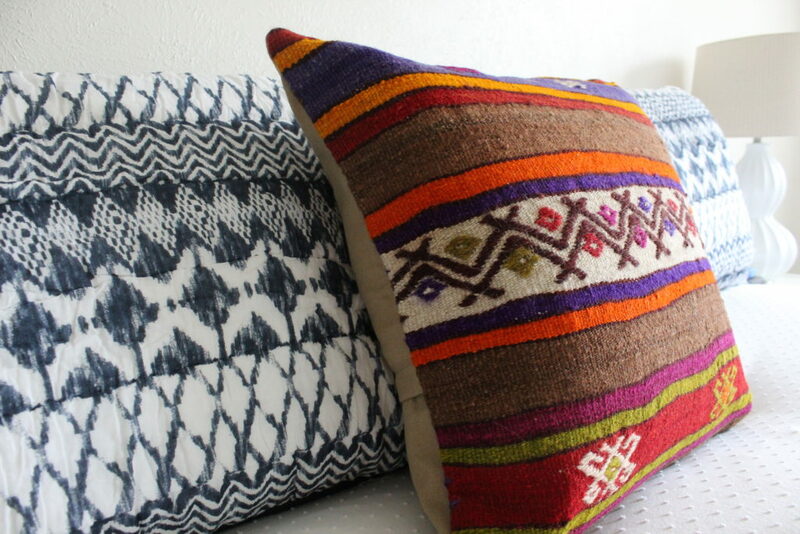 Paired with a Turkish pillow that I found on Etsy, ummm, yes, please. Our room still has a long way to go but a bed seems like a good place to start. I have yet to hang curtains, paint the walls, and add some art. Also, we still have a gold ceiling fan above our heads that desperately needs to go. Until those things are done, at least we’ll be sleeping soundly! I painted the front door over the course of the weekend. What a difference such a small change can make! I’ve said this before, like when we painted our mailbox a few weeks ago. 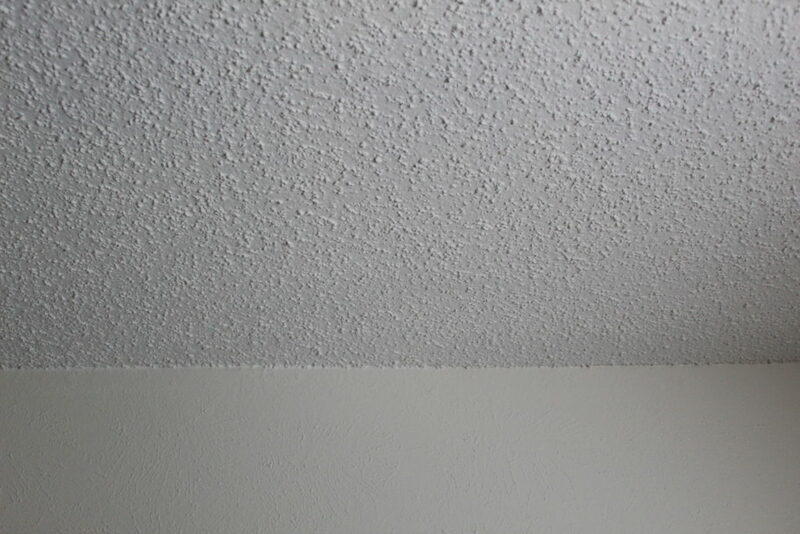 It’s fun to complete some smaller scale projects when there are such big ones looming…ahem…texturing the ceilings. I’m starting to think that we might be living with naked drywall above our heads forever! Nate and I were supposed to be working on said ceilings this weekend but instead, we found ourselves doing other things like playing Foot Golf (Nate, not me) and painting the front door yellow (Me, not Nate). Back to the front door though. Here is what we were working with before paint. 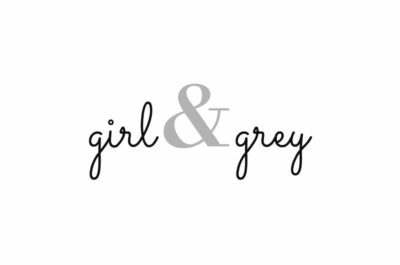 When I started looking for inspo pictures for ideas for this project, I immediately ruled out any colors on the darker side of the spectrum. 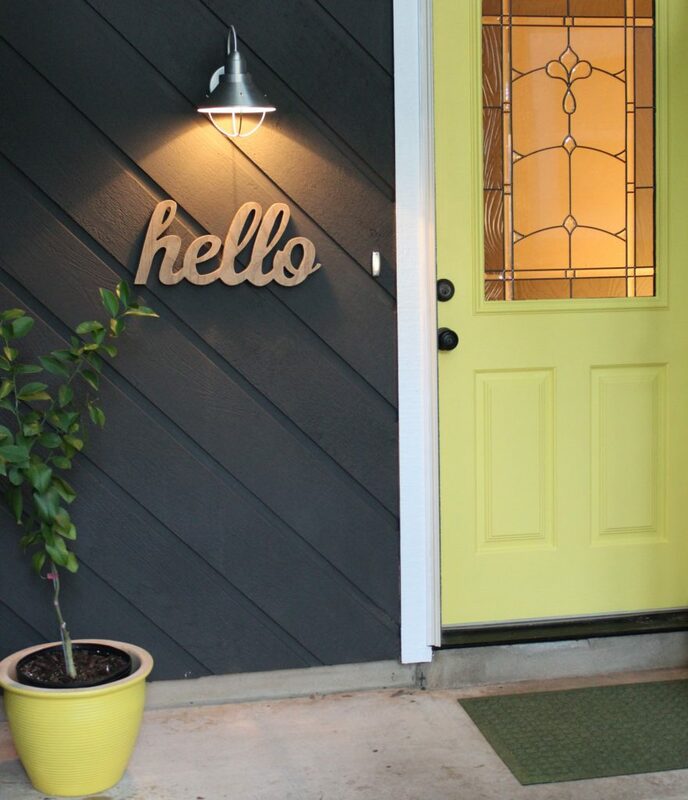 Our house itself is very dark so the front door needed to serve as a pop of color. There are so many cute options though, I liked everything. And I was really drawn to the pinks and lavenders because it seemed like such an unusual option, I mean, who would be brave enough to paint their front door pink!? Well, not me because I ended up going with a cheery yellow. But, I am going to file this away for a possibility for the future. I do like to change things up. I kept going back to this one particular image. I loved the way the yellow looked against the navy exterior. Our house isn’t navy but it is dark and even has the white trim that this color pallet is paired with. Sold! 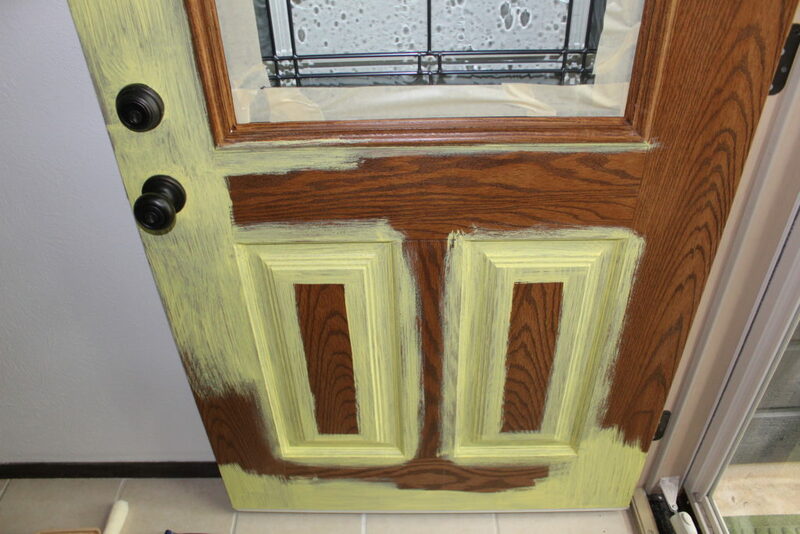 It was a relatively easy process except this yellow paint surprised me with just how many coats the door took to get the proper coverage. 27 coats! I’m exaggerating but it did feel like that when I was painting. I suppose it was mostly because I was covering a dark door with such a light color. So now you are warned, if you want to paint something yellow, be prepared for multiple coats. 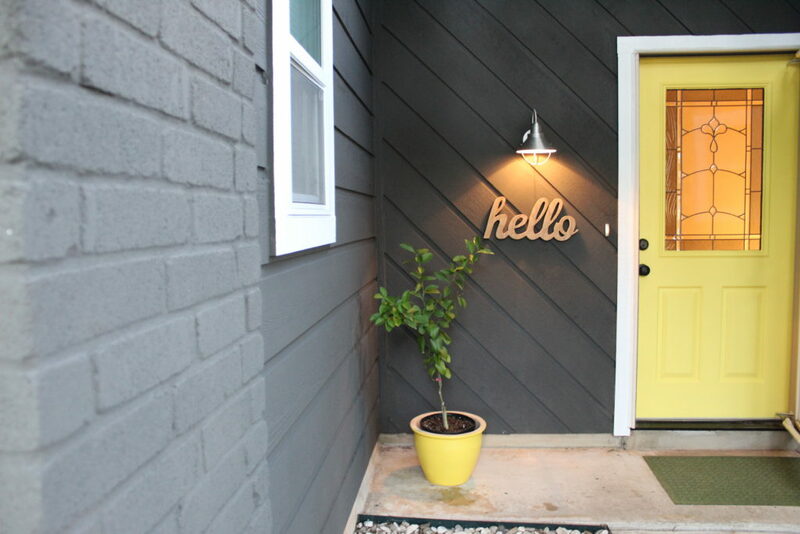 I moved my lemon tree from our screened porch in the back of the house to the front entrance because I couldn’t resist putting our lemon tree next to our new yellow front door. I have also been worried he isn’t getting enough sunlight. So, I fertilized him and gave him a new spot. 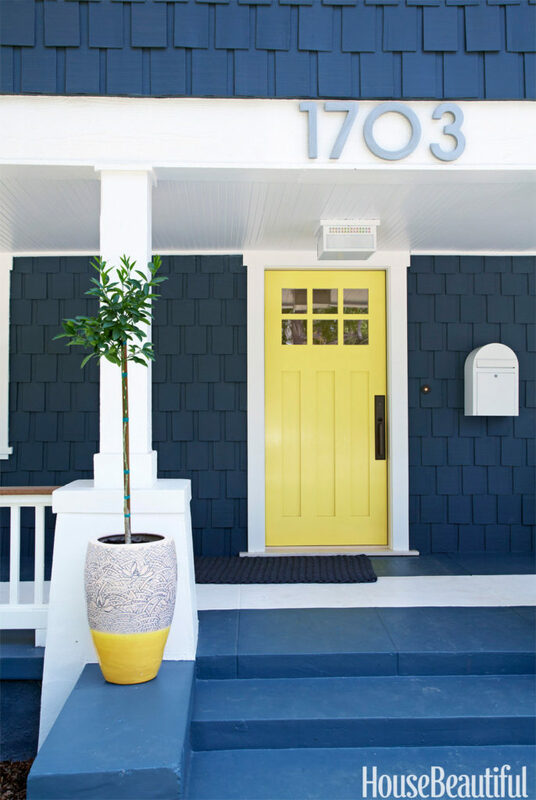 Maybe the yellow door and his new yellow pot will inspire him to produce lots of lemons? Have you ever watched an episode of House Hunters? Well, I have. More times than not, a couple goes through a property and they start saying things like, “we would need all new floors, the bathrooms need to be gutted and everything in the kitchen needs to go.” Nate and I were just as guilty as these folks when we looked at our house. We actually said those things! These “simple cosmetic swaps” mean major work which also means major money. So Nate and I have been discussing which projects are realistic for us as we plan on doing most of these ourselves. We also flip flop back and forth as to which improvements would make the most impact for resale value and which ones we have to get done for our own sanity (like our beautiful pink exterior before we painted last weekend). Ideally, we are hoping that most of our updating will fall into both categories. But, I think we have come up with a list. Not a to-do list because I don’t even like to read my own to-do lists but more of a list of goals we want to accomplish during our time here. Here we go! Painting the Exterior – we are mostly done with this baby! Some touching up and trim work still needs to be done but I think we can call this one done. 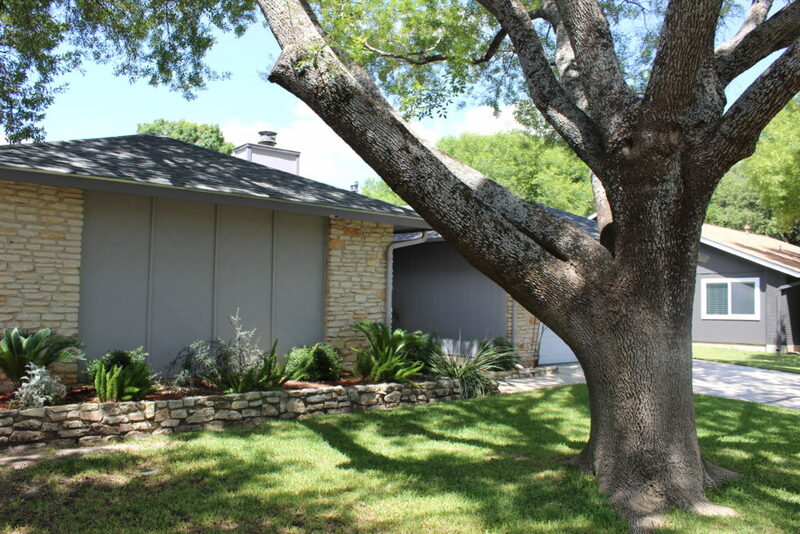 Landscaping front and back yards – the house is kind of a blank slate as far as landscaping goes. The flower beds around the house need to be filled with…something. I’m just not sure what yet. One of our neighbors has this whole landscaping thing figured out. I am hoping our flower beds can be as beautiful as this house. Adding a patio to the backyard – I would like to put some kind of material down in the screened porch on the floors and extend this flooring out onto some kind of a patio so there is a place to spend time in the backyard outside of the screened porch. 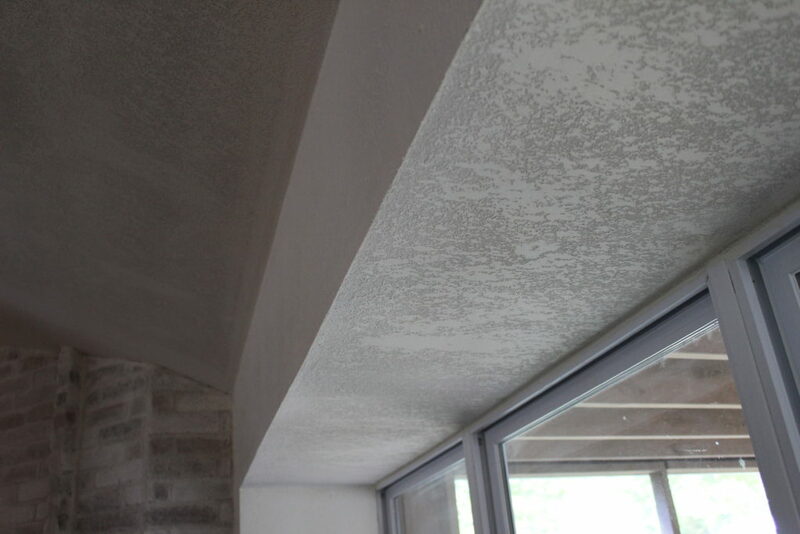 Scraping the popcorn ceilings and texturing/painting – the scraping part is done. The texturing and painting of the ceiling still has to be done. This job actually might kill me…the jury is still out. I’ll keep updating as I go. 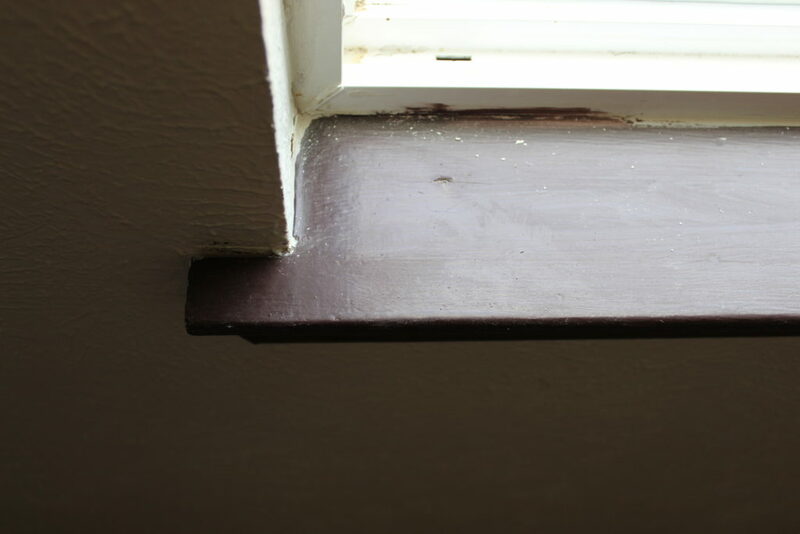 Painting trim and doors inside house – the trim is currently stained an almost black color. I want to lighten this place up and paint everything white. 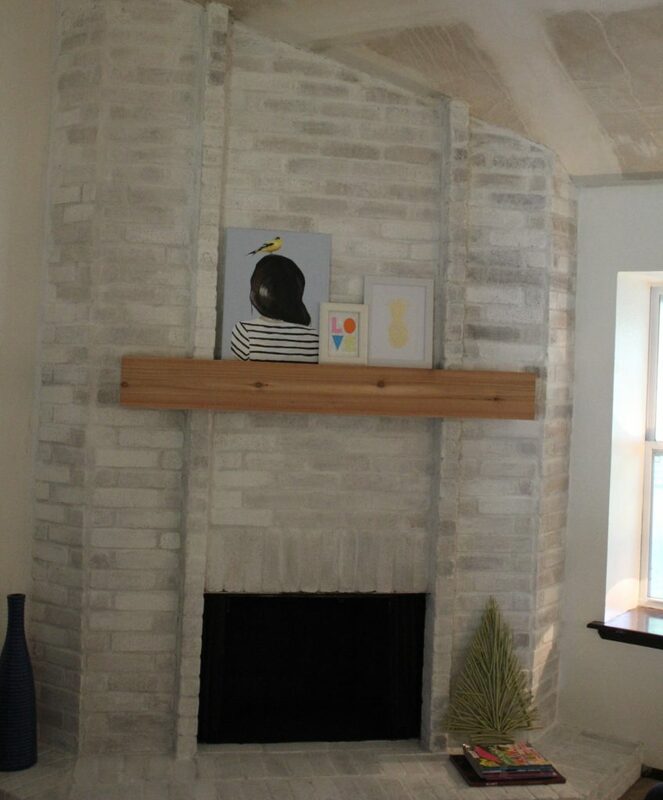 Whitewash the fireplace brick – in my quest to lighten and brighten, the fireplace needs a dose of white paint too. I’m going to try my hand at whitewashing. 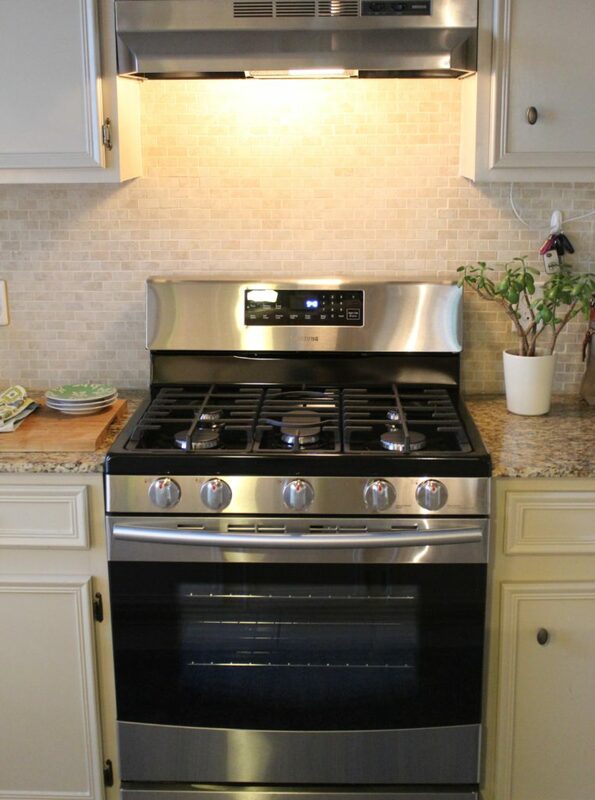 New appliances for the kitchen – our current appliances are old and white but are functioning fine, for now. New counter tops for the bathrooms – the plan is to keep the current vanities with some updating with paint and hardware. But, counters are a must. 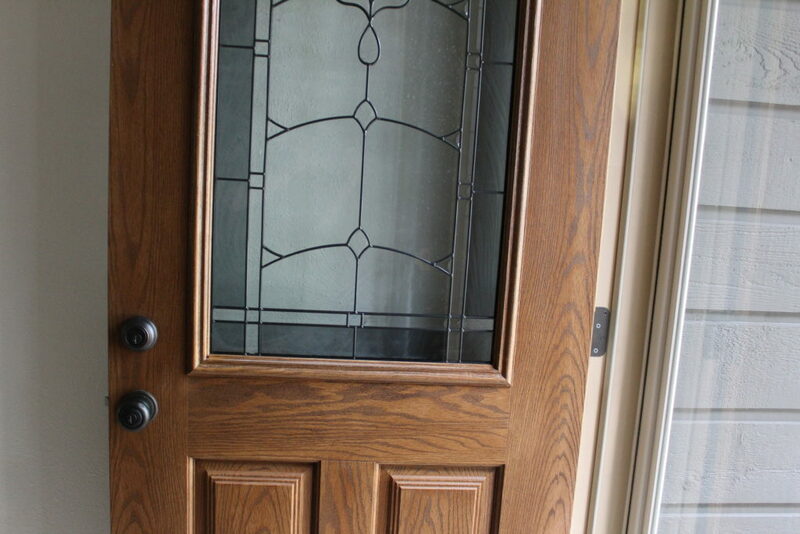 Paint the front door – I can’t decide if it needs to be replaced or if paint will be enough. I’m debating between these two colors right now. Thoughts? So these are our goals as of right now. I’m sure we will change our minds about some of these but for right now, this is what we are planning. There’s definitely no shortage of things to do but I love a good challenge and these projects are definitely going to challenge us. When I decided that the kids would be sharing a room at this new house, I didn’t give much thought about the combining of the toys and books that each of them would be bringing from their respective bedrooms. Even though we have a “less is more” theory with toys, there still seem to be quite a lot of them floating around. If a kiddo hasn’t played with something in a while, out it goes. Nolan just started collecting Shopkins which I think is perfect because they are so small. Nate and I had to Google what Shopkins were…and we still have no idea. Grey likes cars, trucks, trains and just about anything with wheels. But I do try very hard to make sure that the toys don’t take over the whole house. Nate and I definitely don’t want to be living in a big play room. 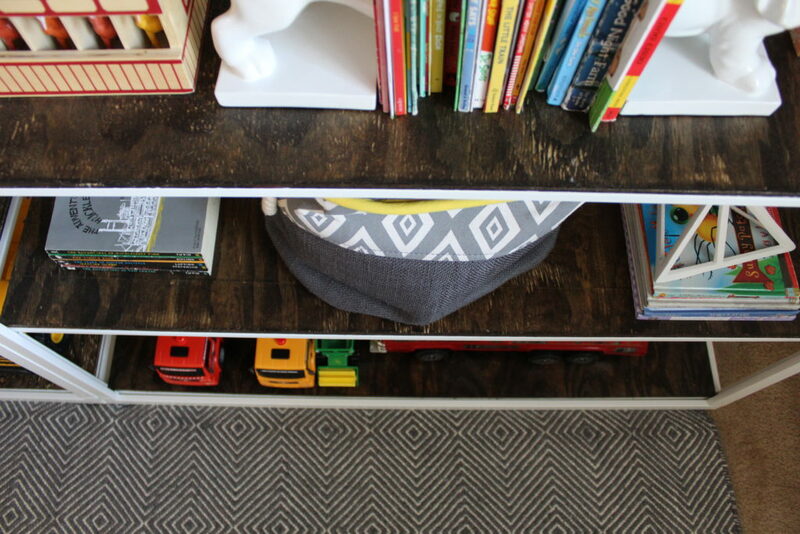 I have been hunting for some toy storage solutions and found lots of ideas that I liked, but sadly, were not in the budget. 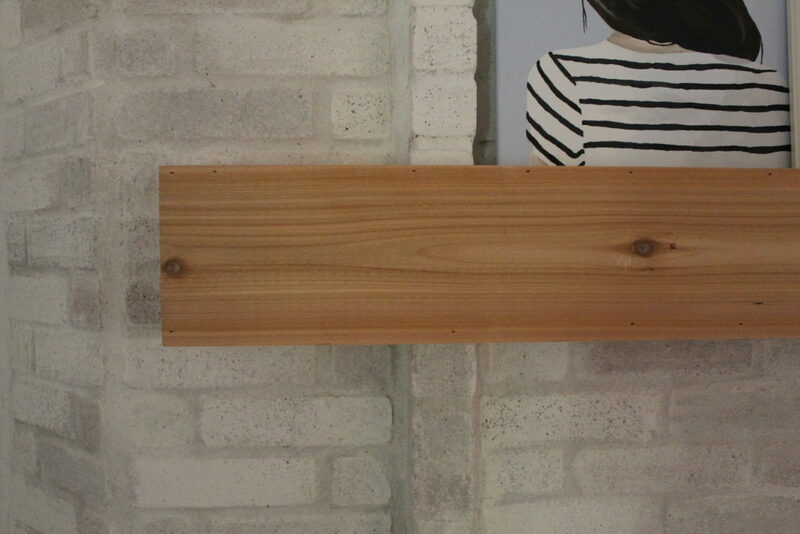 I was especially in love with some open shelving from Serena and Lily. 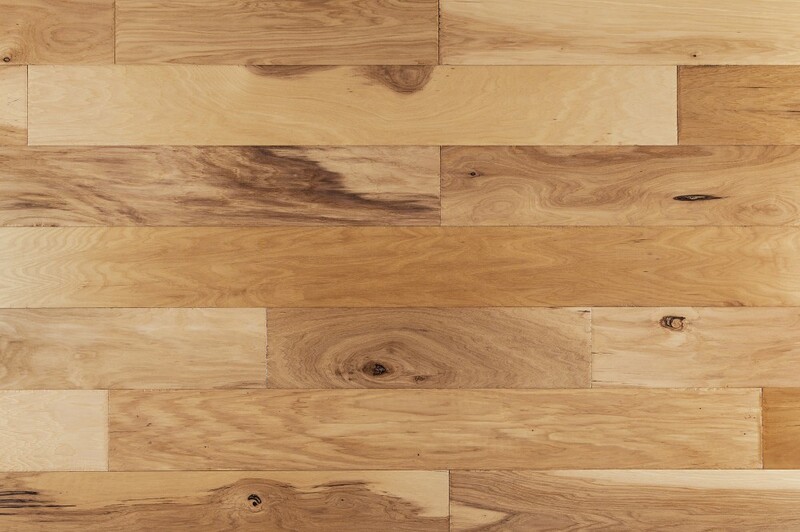 I am loving the wood+white look and always find myself attracted to the rustic/modern look in homes and furniture. 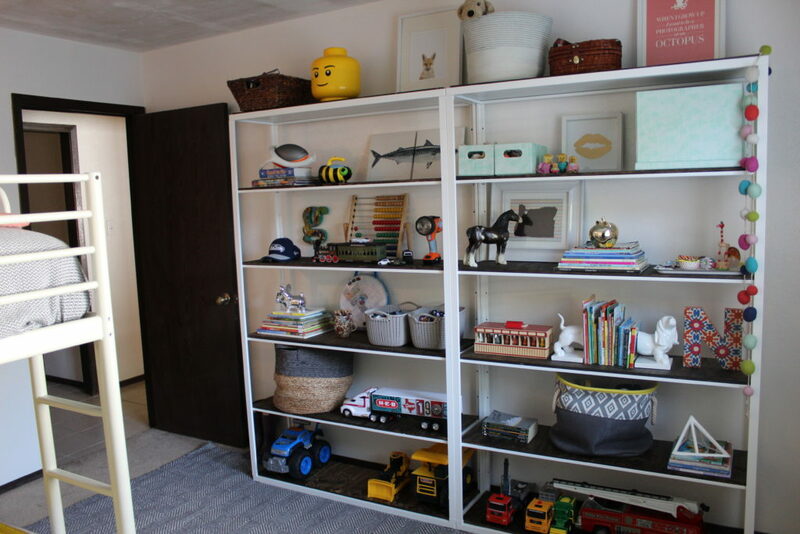 The space in their room would have called for two of the taller shelves to take up the better portion of a wall. So this little purchase would have set me back $2,390 before taxes and shipping charges. Ummm…yikes. Somehow, I ended up at Ikea…again. But found the perfect shelf! I could buy two of them and they would easily fit into the space I had in mind. 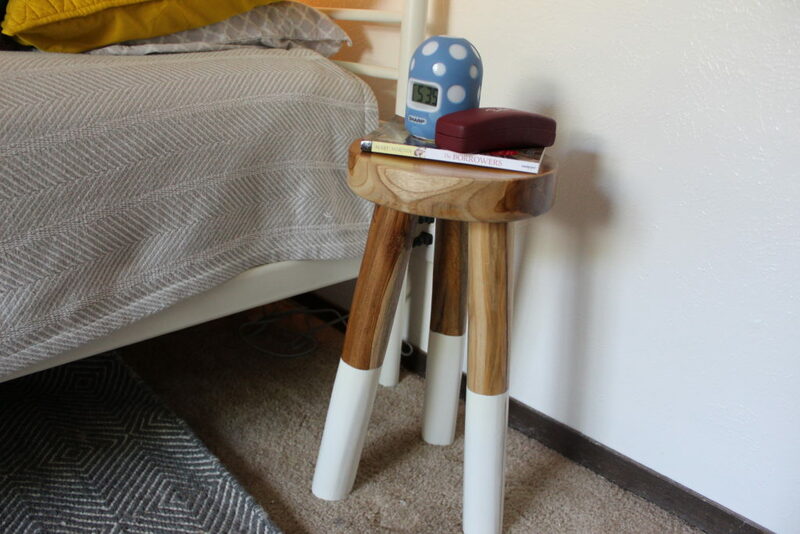 A couple of ideas popped into my head to modify them to satisfy my wood+white obsession. 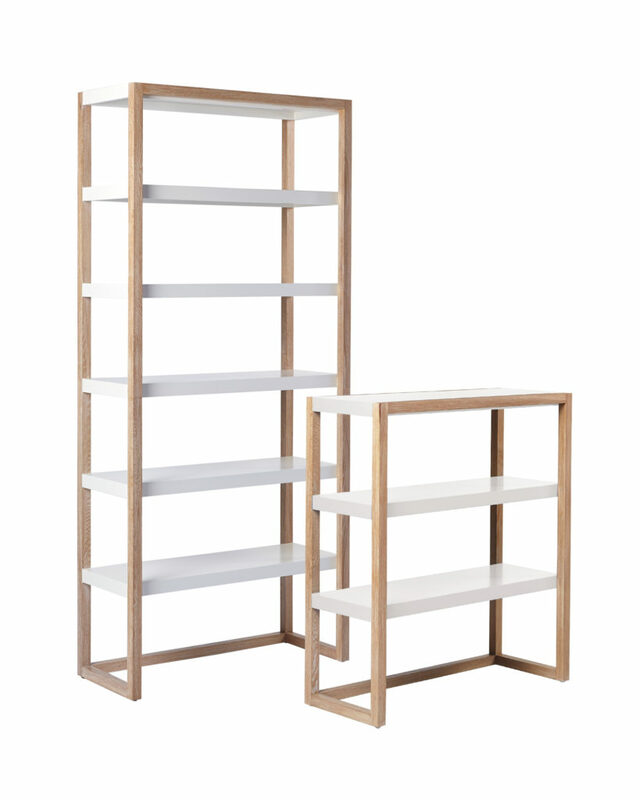 Meet Ikea’s Fjalkinge shelving unit. Nate and I ran to Lowe’s and grabbed two pieces of plywood and some dark walnut stain. We had a friendly fellow cut our pieces down to the size of each individual shelf right in the store for us so we didn’t have to rip any of the boards ourselves, which Nate loved. So all that was left to do was stain the wood and let it dry outside for a couple days. 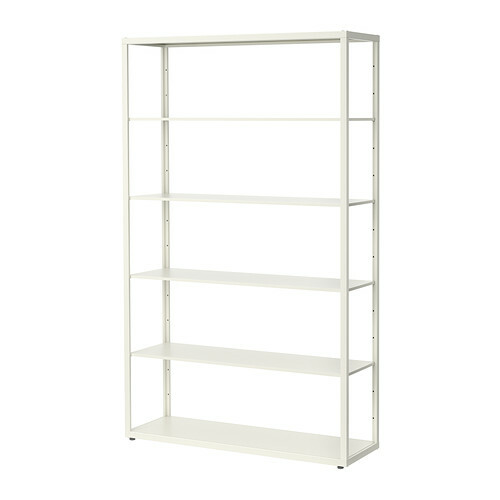 As far as Ikea assembly goes, (and we have had a lot of practice) these shelves were super simple. Once the plywood pieces were all dry and no longer smelly, we just slid right into place on top of the white shelf insert. My dad always says, measure twice, cut once. Well, we might have measured seven times, but no mistakes were made and the boards were just the right size. I also scored a little night stand and a rug too! Notice the wood and white theme? Points for consistency, no? 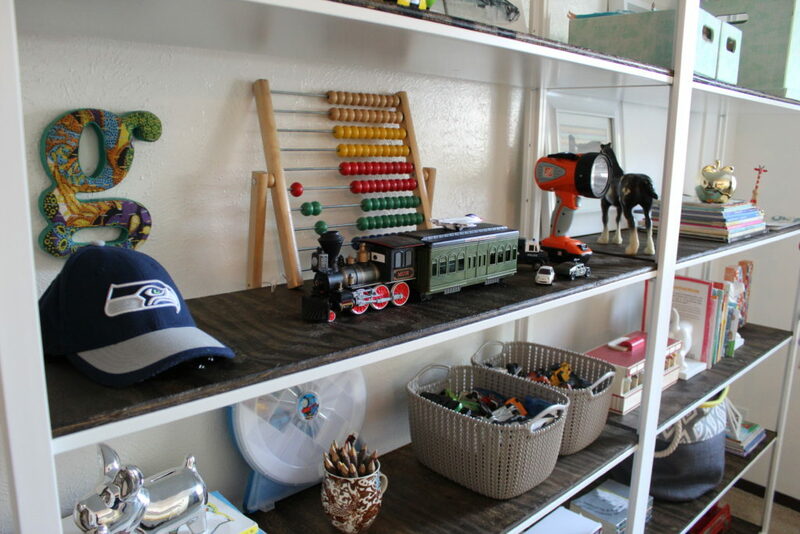 The best part is the kids toys look so super cute out on display on their new shelves. I kind of did a Grey side and a Nolan side, although there was no way his cars and trucks weren’t going to spill over onto her side. I will probably tweak the arrangement of everything as I add some better looking baskets and move everything around. I can’t help myself. Nate always laughs at me because objects are always moved, furniture is rearranged and nothing really stays the same in our house for very long. The room is starting to really come together in such a fun way. I thought it was going to be really tough to decorate for a boy and a girl in the same space but as it turns out, I’m kind of a neutral kinda lady. Who knew?